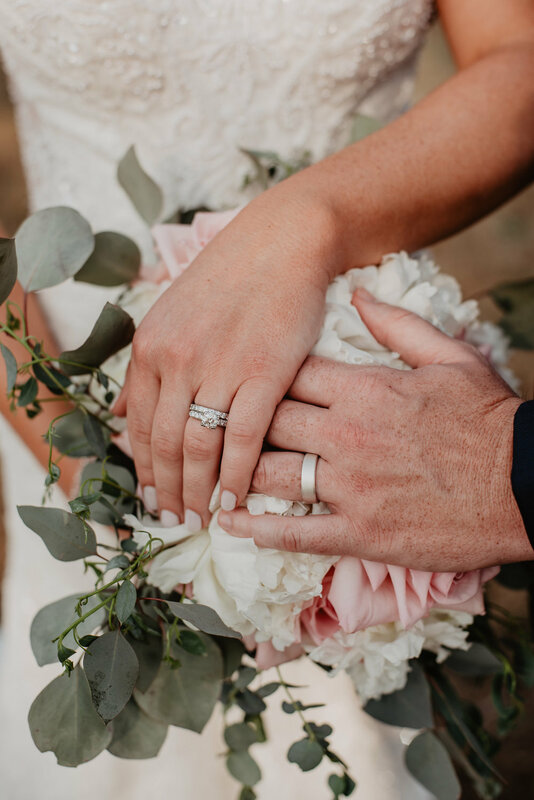 I’m so thrilled to be sharing this beautiful wedding with you guys today! Marissa and Mark not only had me photograph their perfect September wedding day, but I also worked on their invitations throughout the summer. 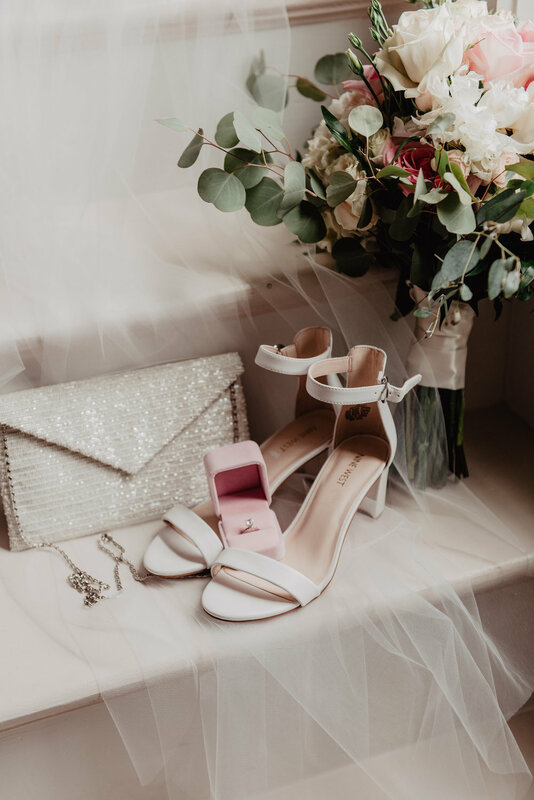 It’s always such a joy to be able to help my clients out with both photography and stationery, and it builds a really nice relationship that puts me at such ease on their wedding day. 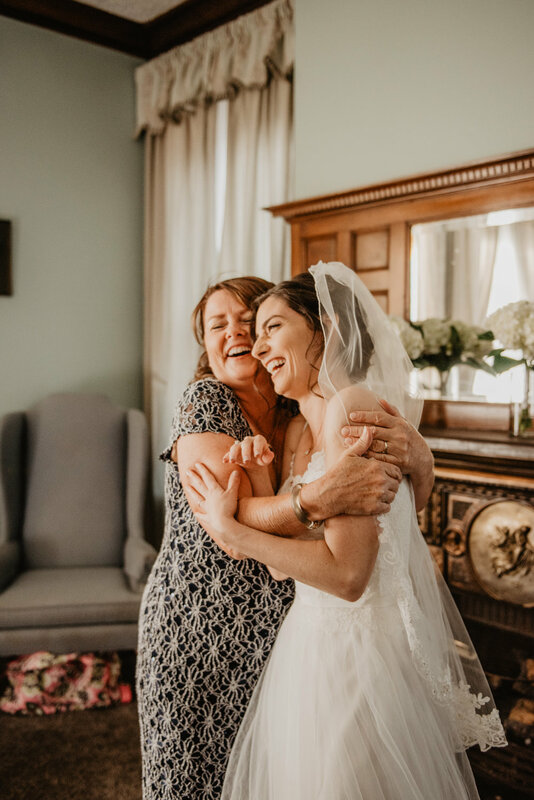 It’s not lost on me that when I begin coverage on a wedding day, I’m entering into a really sacred space filled with years and years of love, friendship, and family. It’s my job to quickly insert myself into that space and sense all of those special bonds so I can capture them thoughtfully and accurately. That’s why it’s important to forge a good relationship with all of my couples beforehand! Marissa began her day on the beautiful third floor of the Sinclair of Skaneateles. I believe they had only recently renovated this floor, to be used as a space for bridal parties to get ready in and store their things throughout the day. It’s such a bonus to this space that I’m personally really grateful for. 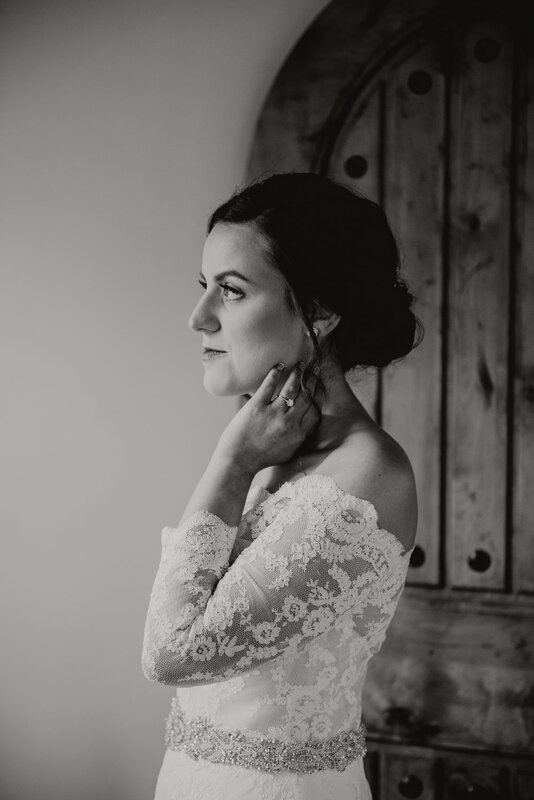 I took some killer portraits of Marissa before she headed down to their first look - they’re some of my favorite bridal portraits ever! 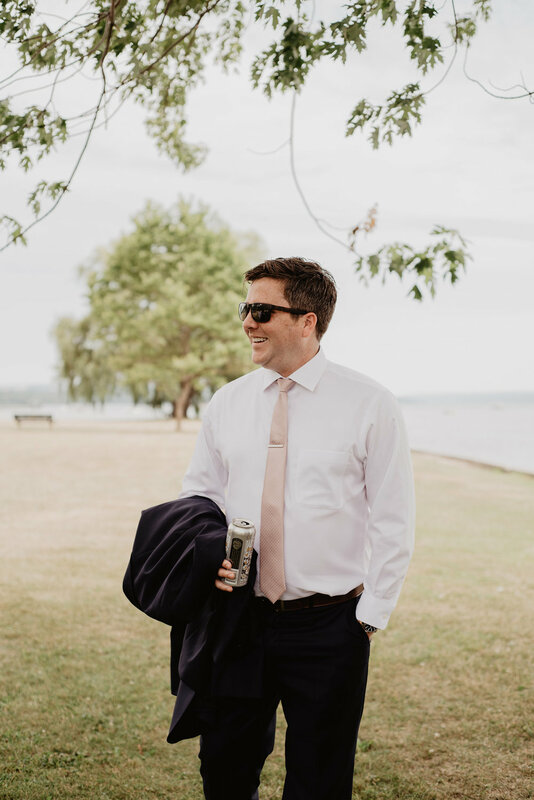 Mark and his guys arrived on site just before we planned to do their first look, and my sister Olivia captured some of their “getting ready” photos then and there. 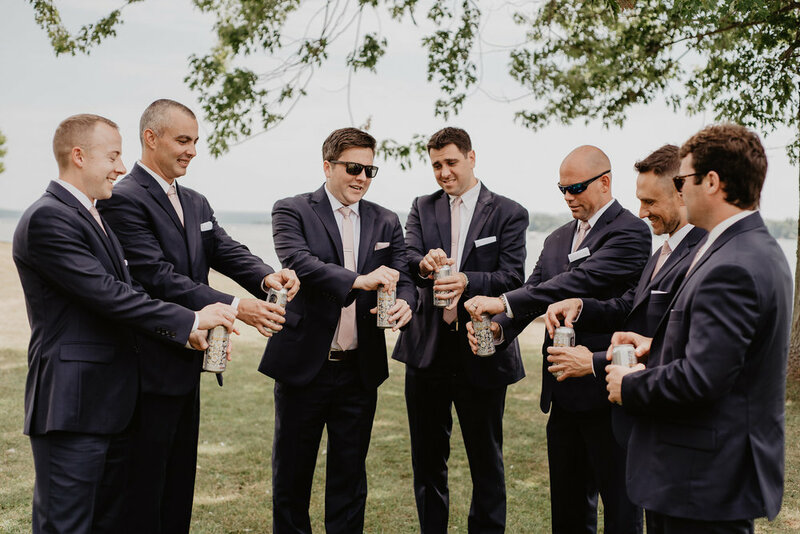 For some, having a bunch of photos of the groomsmen preparing for the day is not necessary so we always offer to do a condensed version of those photos when they arrive for the ceremony, whether that’s at a church or the reception venue. 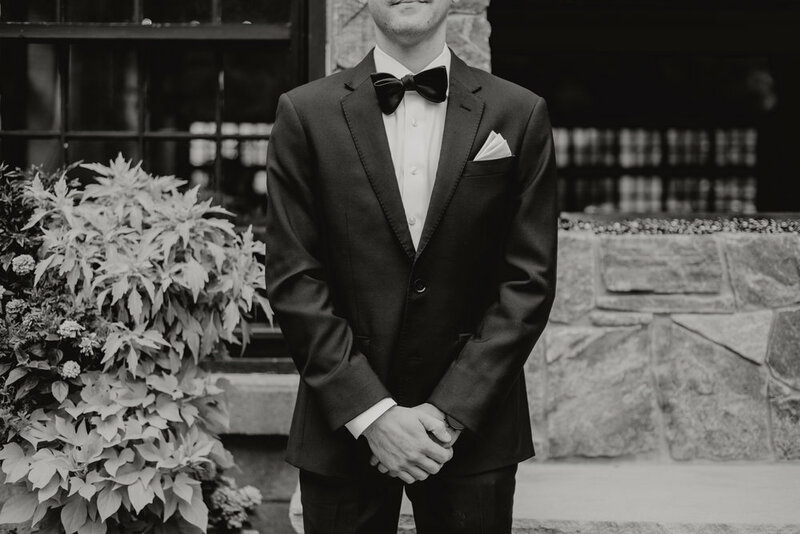 This is also great for grooms who don’t love having their photo taken! 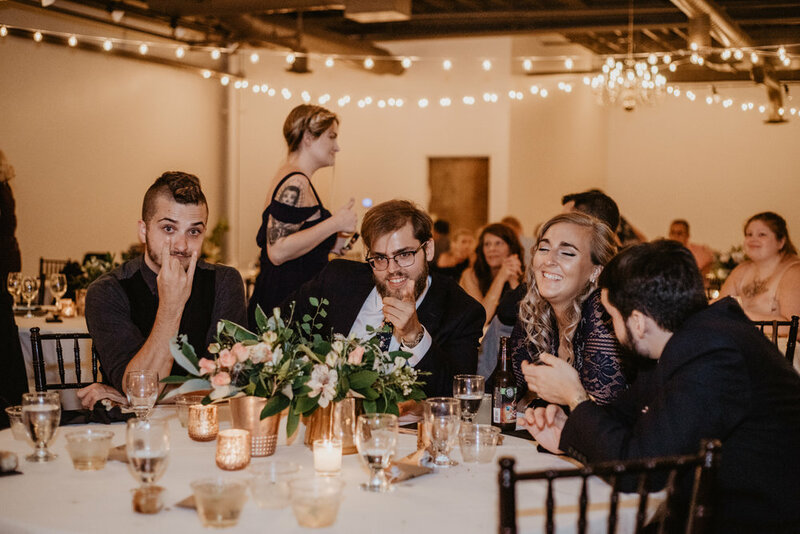 I’m still SO in love with all of the group and couple photos from this wedding. The grass is always a little darker and more lush in September and the sun a little bit lower and shadier, giving me the ability to make their photos look very dramatic - a look that worked well with their beautiful black bridesmaid dresses and classy tuxedos! 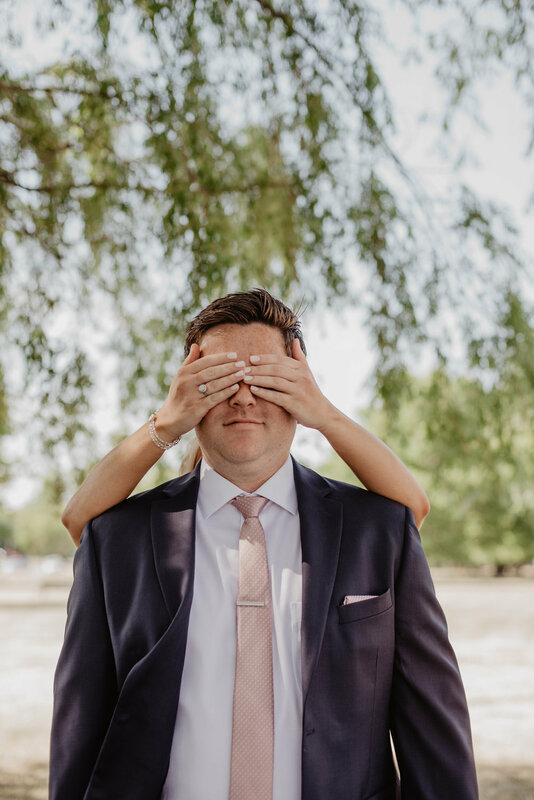 Thanks to these guys opting for a first look before their ceremony, we got all of their portraits done early in the day so they didn’t have to worry about being separated from their guests at all! Mark and Marissa’s ceremony also took place on the Sinclair property, and was officiated by Mark’s cousin, Nick Musso. 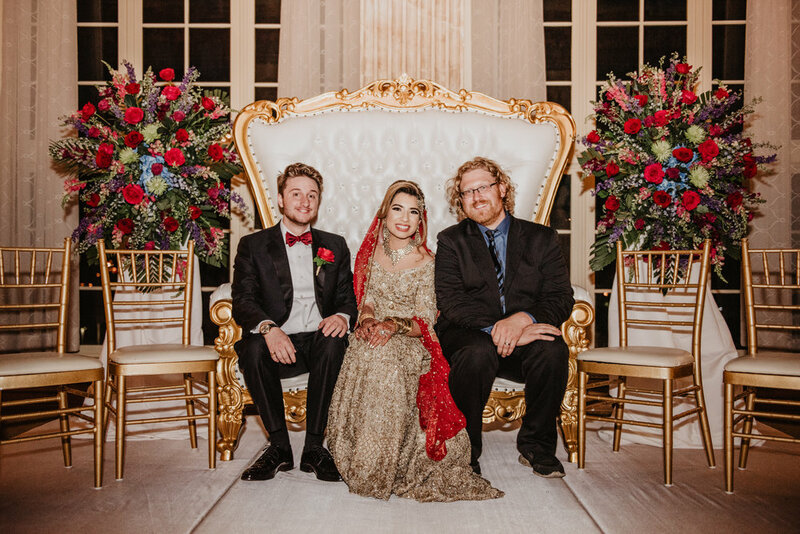 I loved his funny commentary, and how he made their ceremony very personal and interactive. 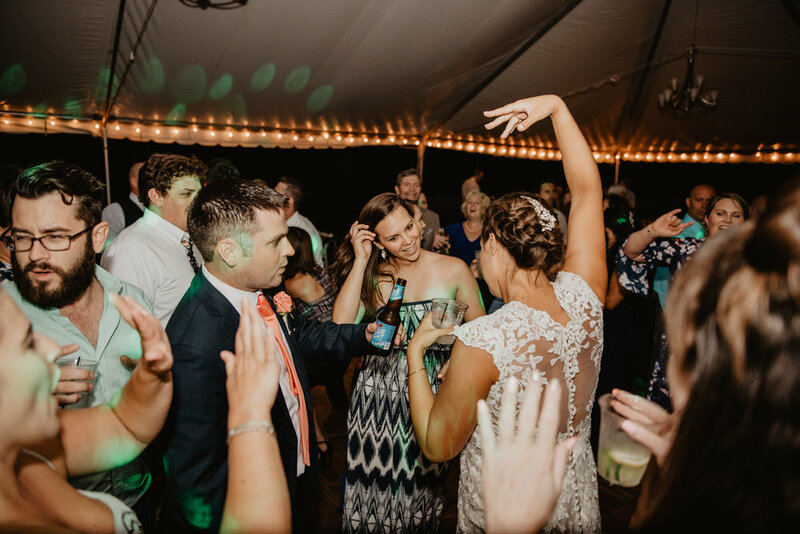 This reception was one where I think every guest must have hit the dance floor at least once! It’s not always the case that family - both young and old - get out there, but Marissa and Mark’s sure did! Thank you guys SO much for having me photograph your beautiful day, and for having me along for your planning process as well. 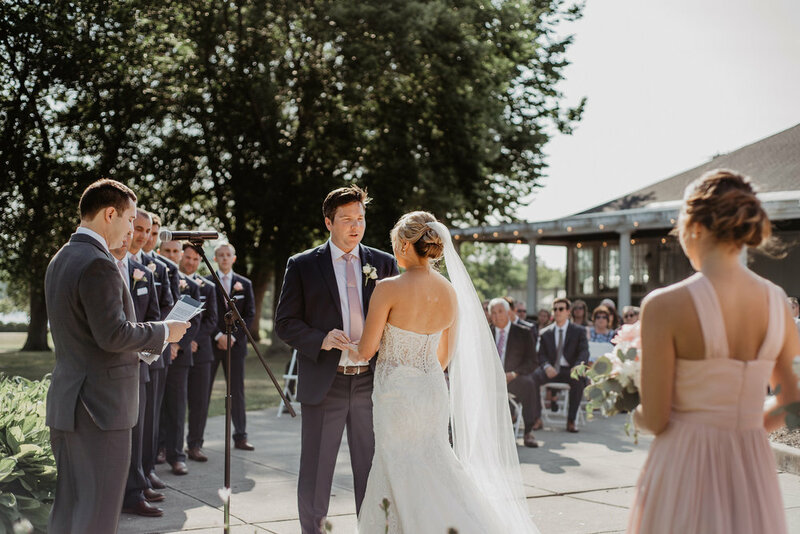 My second wedding at the beautiful Arbor Loft in Rochester NY was such a special, fun experience! 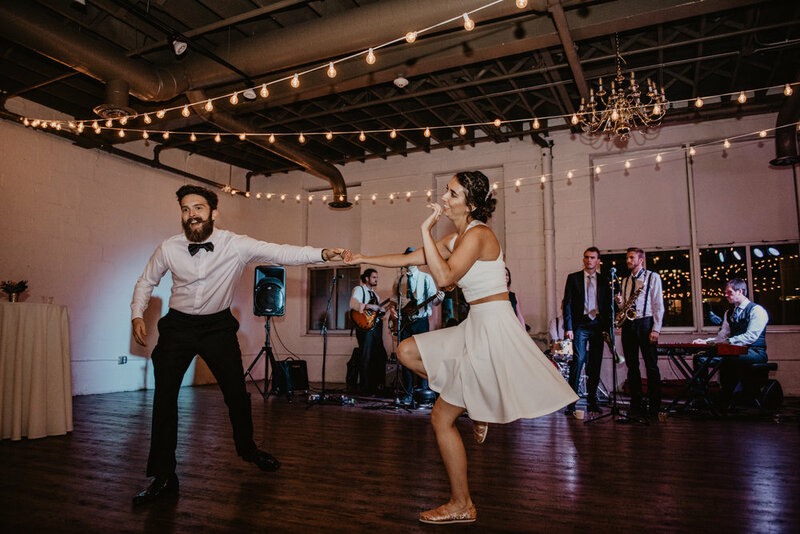 Brooke and Brandon are both swing dancers - he proposed to her at a swing dancing convention - so their reception featured a swing band and lots of great (and borderline dangerous!) swing dancing. It was such a unique night for me! But, I’m getting ahead of myself! 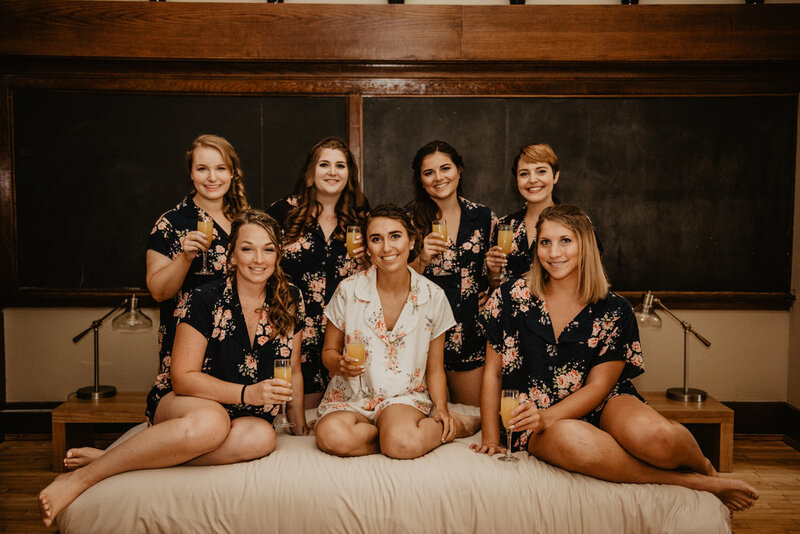 Brooke and her gals got ready in the most beautiful renovated old school building, near the Memorial Art Gallery, which can be rented out like an AirBnb and features the pull-down chalkboards along one wall of the room, a neat lofted bed, super high ceilings, and lots of charm! I had fun hanging the dresses and styling the detail shots in that space. Brandon and his guys got ready in the apartment that he and Brooke share. 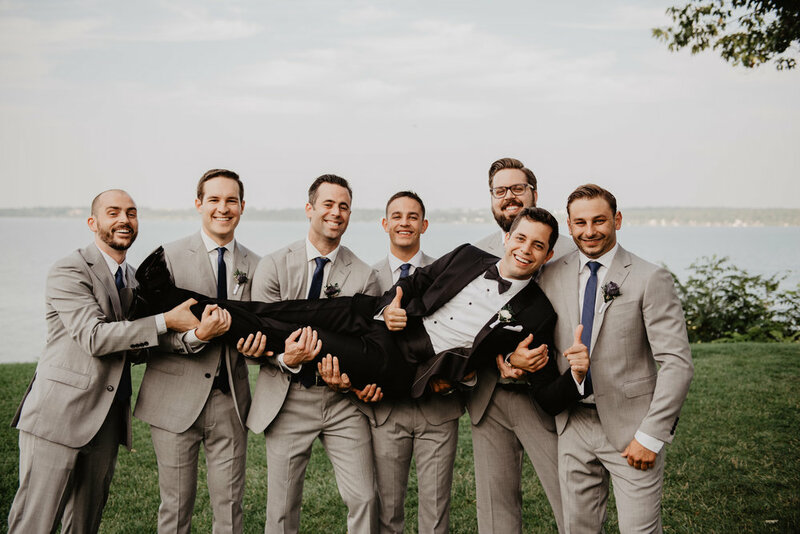 It was a beautiful day outside, so my sister Olivia took them out front and had lots of fun making the groomsmen toss Brandon up in the air. 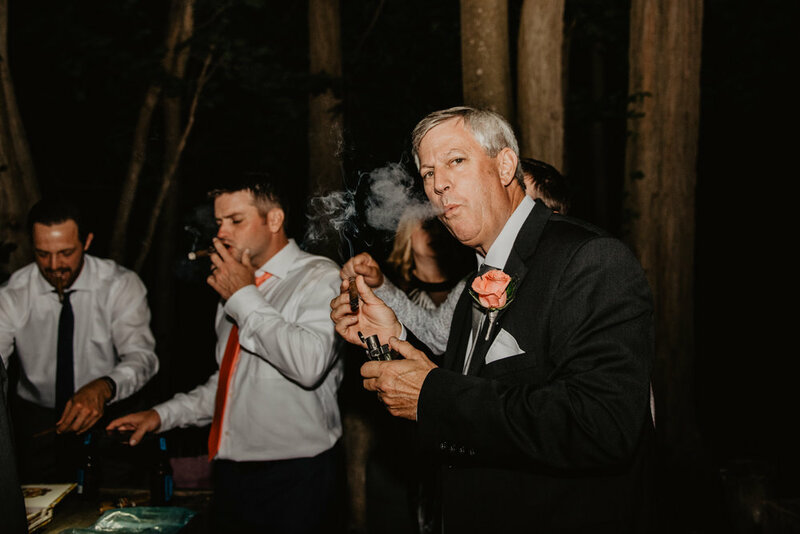 Who says your wedding photos have to be all serious? I like a mixture of both! 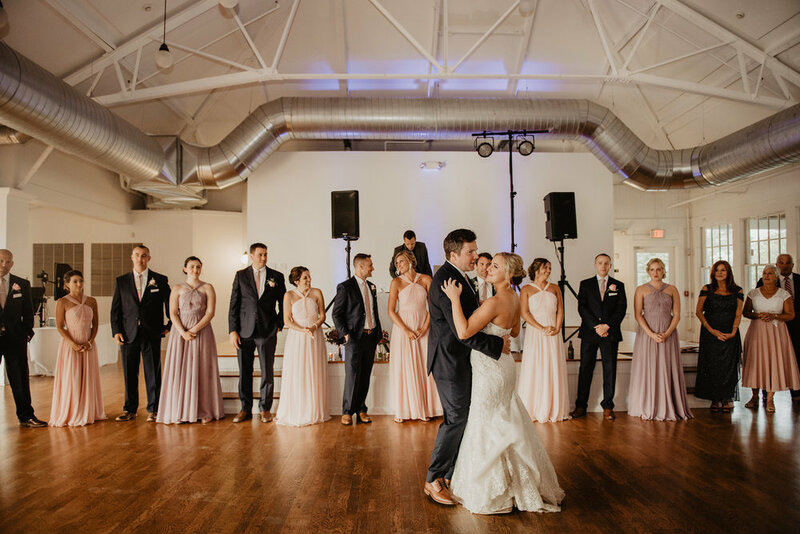 Brooke and Brandon’s ceremony took place at Artisan Church in Rochester, and was a wonderful and personal experience. They’re regular attendees of the church’s services and knew the pastor and his wife very well! I love that many of the couples whose weddings I’ve photographed in Rochester share a similar experience with their churches/pastors. It’s definitely a place that values that type of relationship with their worship community. After the ceremony, we headed to the Sunken Gardens in Highland Park to take their bridal party and portrait photos. I love using the castle there as a backdrop - architectural settings are my jam, if you couldn’t tell! We then traveled to the Arbor Loft, where the bridal party headed to the cocktail hour and Olivia and I took Brooke and Brandon around the neighborhood for some more portraits of the two of them. These are some of my favorite Rochester photographs! I really love when a couple is open to just taking a walk and seeing what we stumble upon. I imagine it can be hard for them to trust that vision, but I’m so glad when they do. 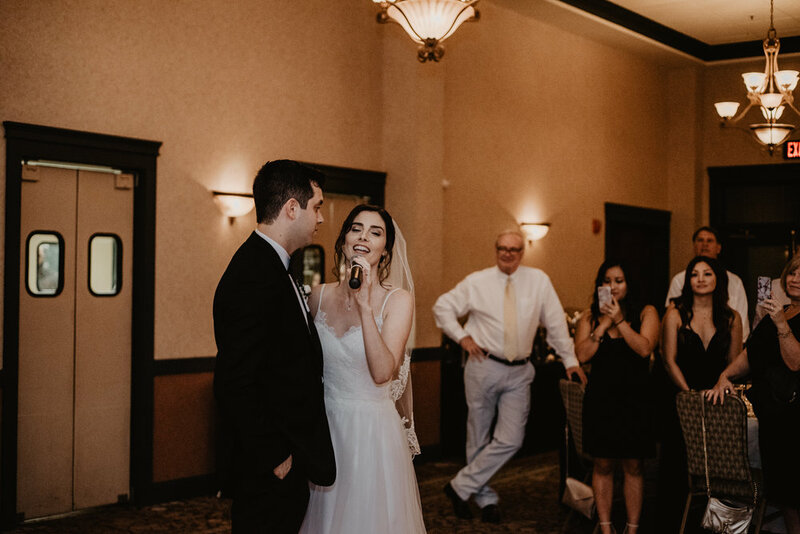 As I began this post, their reception was just so much fun. I loved seeing different movements, hearing familiar songs being sung by the amazing Swooners, a local swing style band and last but not least, their donuts from Scratch Bakeshop. 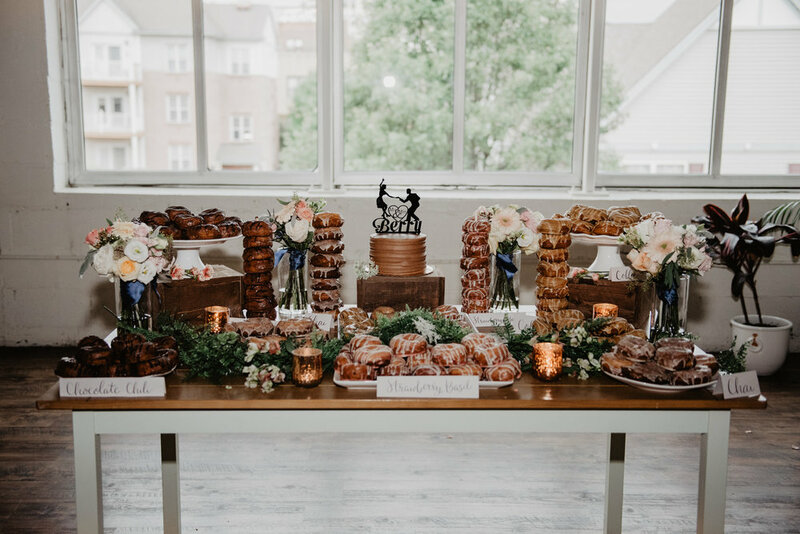 The decor of their reception was simple but really beautiful - something that many Arbor Loft weddings have in common because the space speaks for itself! After a while, Brooke changed into a second outfit that she could “swing” much easier in, and then danced the night away. 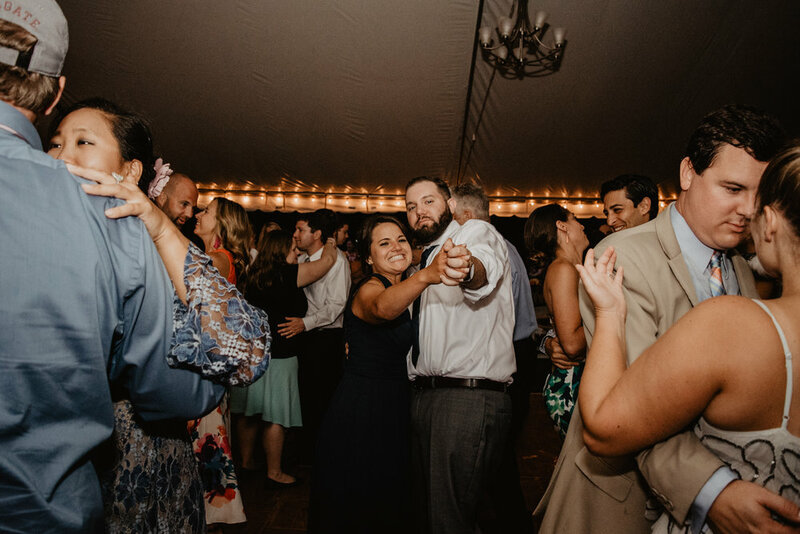 I think the two of them hardly left the dance floor all night, and they inspired all of their guests to try swing dancing too! It was sort of silly watching some of the guests try their versions out, but I loved the energy in the room with everyone trying something new together. Thank you, Brooke and Brandon, for having me photograph this special day for you guys! It was such a blast. Hey there! 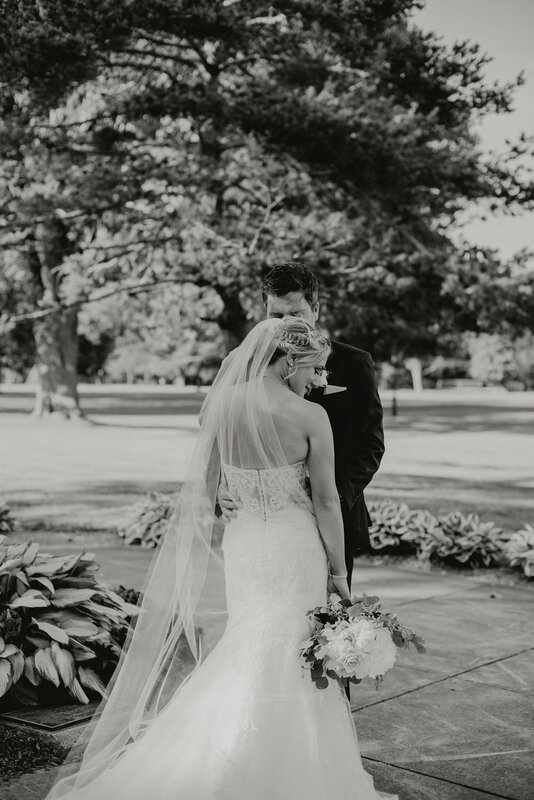 Today I’m sharing one of my favorite shorter wedding days ever. 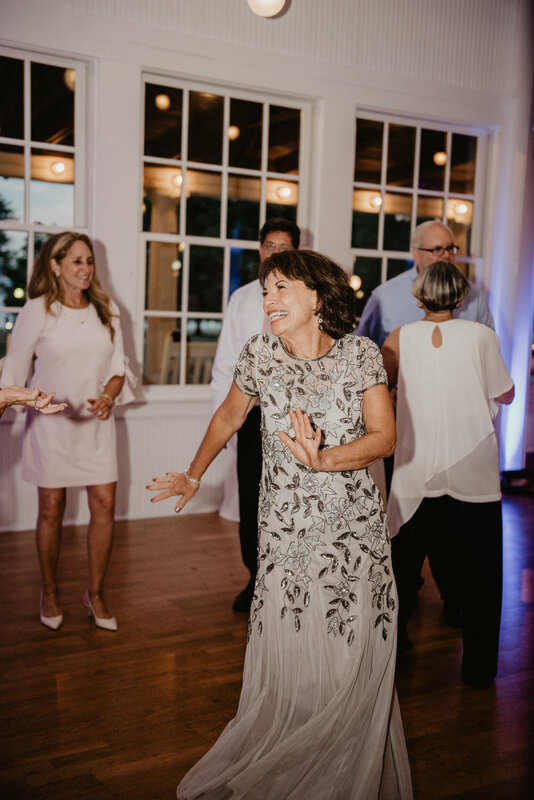 In the summer, it’s totally possible to start your wedding later in the evening and still have the full experience and no shortage of fun! 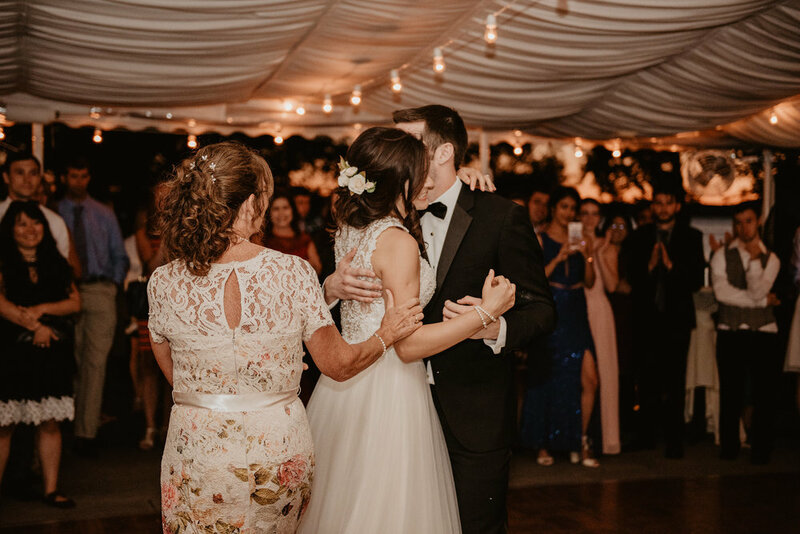 That’s exactly the case for Jessie and Brett, whose wedding at Belhurst Castle on a Friday evening in August 2018 was so special and beautiful. 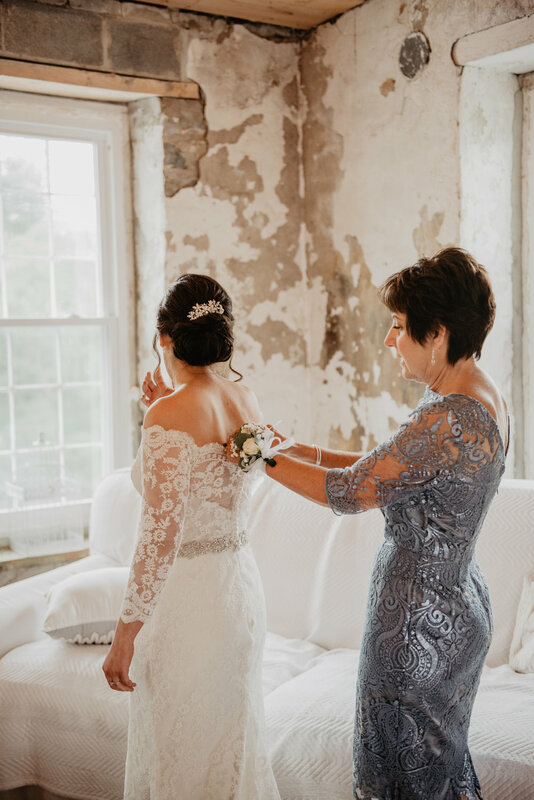 My sister and I arrived later in the afternoon to do some quick “getting ready” photos with each of them, before going right into their first look on the grounds of the castle that overlooks Seneca Lake. The clouds made for a perfect light diffuser and therefore, the most luscious greens and skin tones in all of their photos! 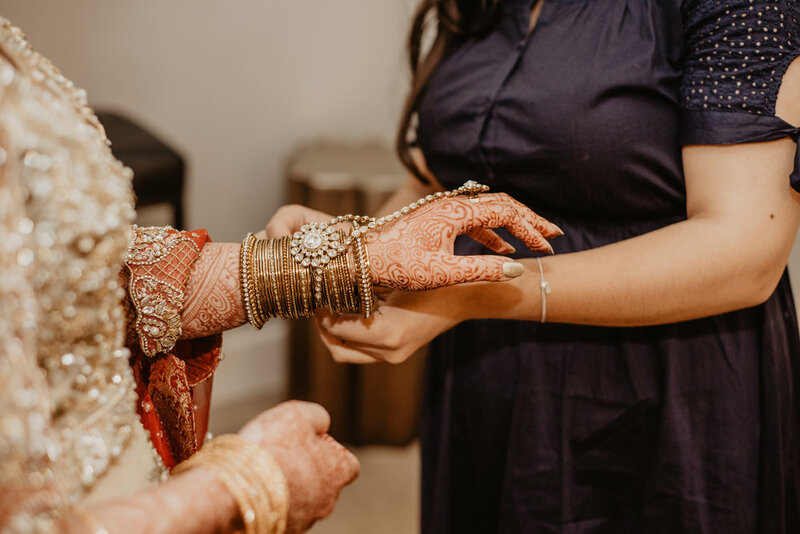 Their ceremony was full of beautiful, intimate details like readings inspired by literature and a traditional hand fasting ceremony, made special by the couple’s mothers. To top it off, a bubble exit for some whimsical, joyful photos of them coming back up the aisle as a married couple! Nothing was more perfect than the view over the lake as the sun set behind it and the full moon rose high in the sky. The water was a deep, glassy blue-grey that matched the sky and made an endless-looking backdrop for their portraits together. The best surprise of the night came at the start of their reception, which was made simple by no fancy entrances or introductions besides Jessie and Brett themselves. Their friend and groomsman Erik played the ukulele in the background of their joint rendition of “La Vie En Rose” - Brett with the words in English and Jessie with hers in French. 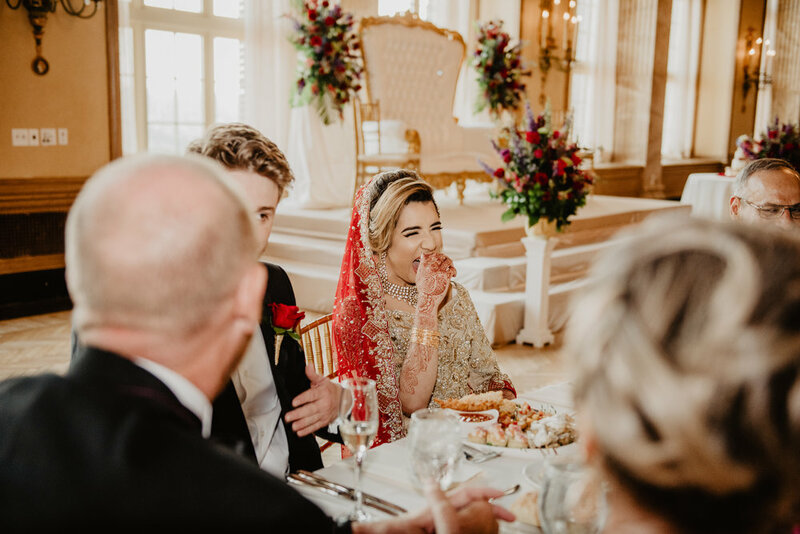 I mean… definitely a highlight of my 2018 wedding season! I didn’t ever want it to end! Then, with no time to waste, Jessie switched into a jumpsuit so she could properly show off her fantastic dance moves and the party started! 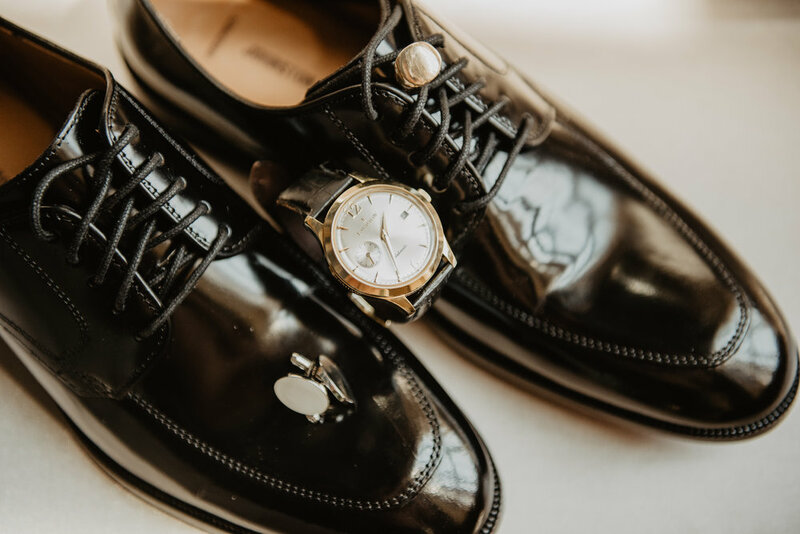 Their wedding was one that was full of really special details but nothing more than what was needed. I’m so glad I was able to be the one to photograph it all! 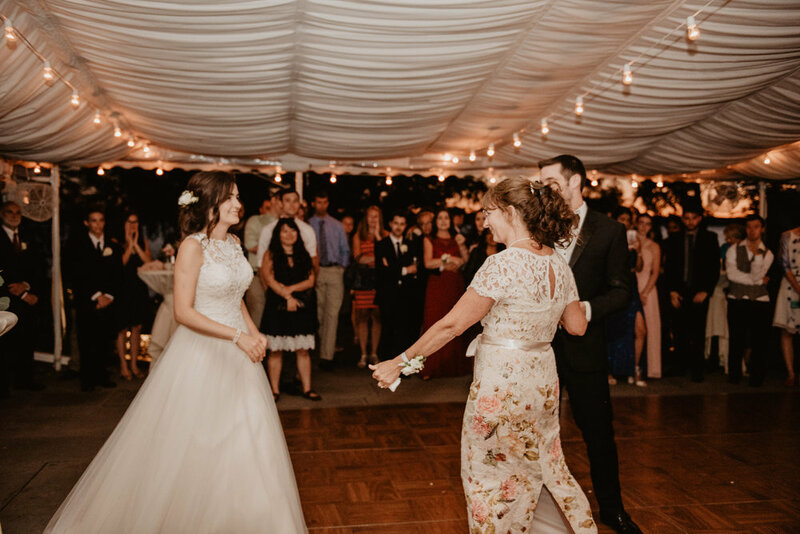 Jess + Kevyn’s wedding day was one that I looked forward to for such a long time - literally, because they booked me almost two years before their wedding! 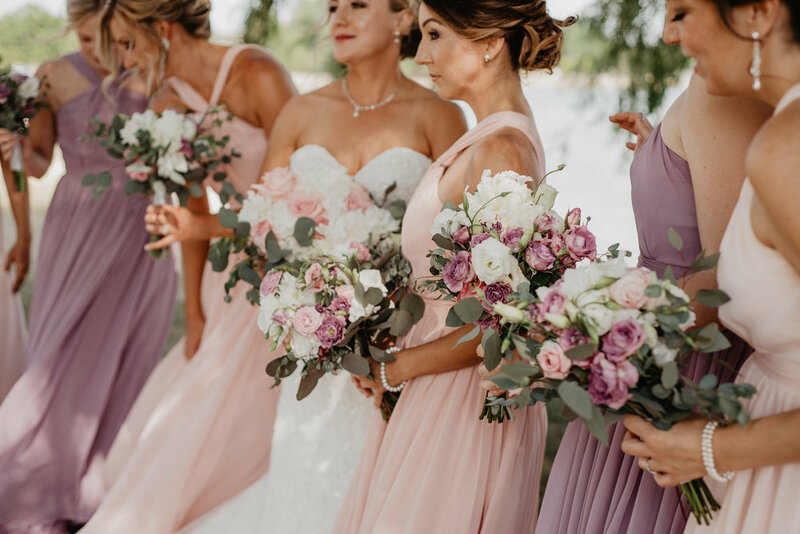 Jess was a bridesmaid in one of my first weddings ever, so I was overjoyed when she and Kevyn chose me to capture their day. 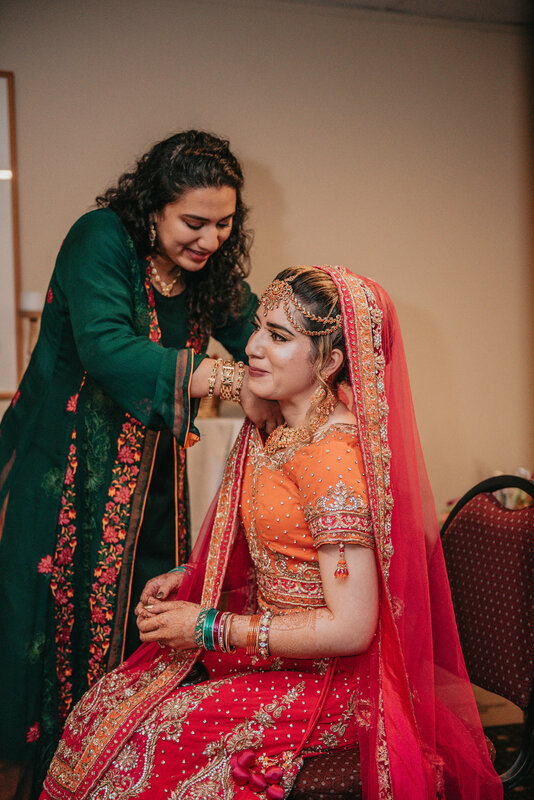 I’ll always be thankful for those first few couples who loved my earliest work and trusted that I would get even better in time for their wedding day. 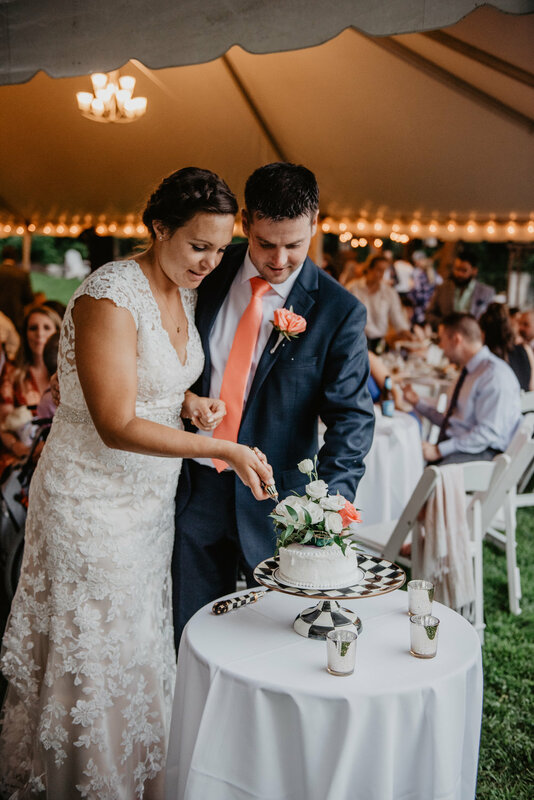 The morning of their wedding on August 18, 2018 began overcast and windy. 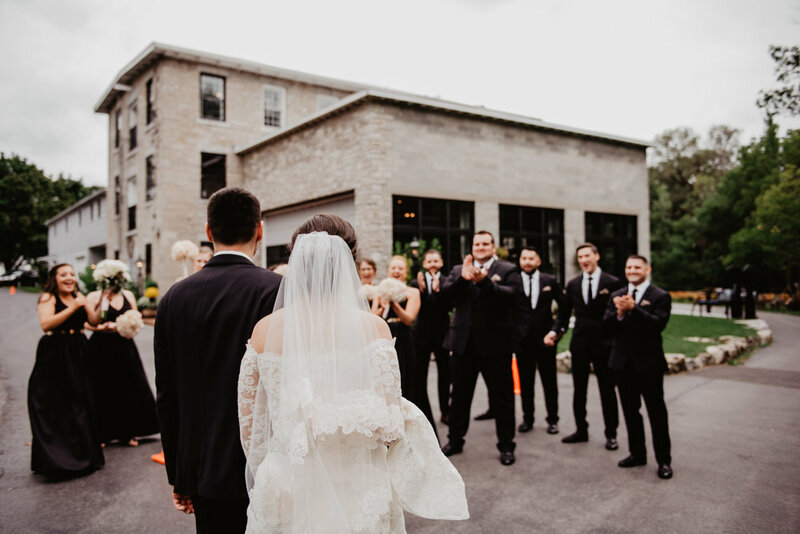 I remember Jess was nervous that it would suddenly turn to rain, but luckily the clouds turned fluffy and white and it ended up being a beautiful day in Geneva, NY! 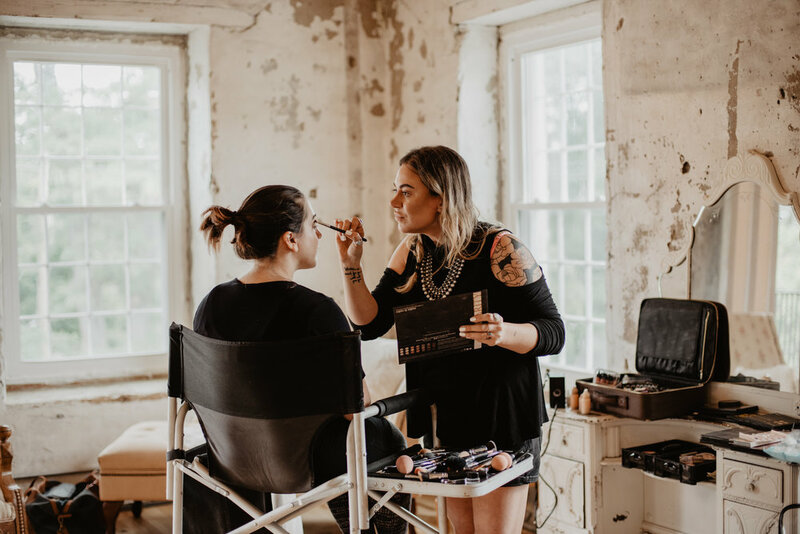 She and her girls rented out a gorgeous historical Georgian home near downtown to get ready in, which was such a treat to have as the setting for the start of our day. 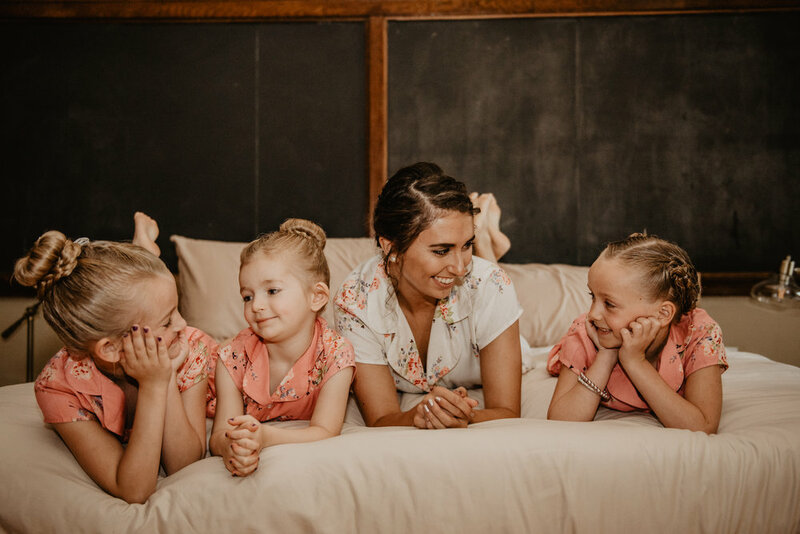 I loved how her bridesmaids gathered together within the two upstairs bedrooms and watched each other get ready for the day, joking and laughing all morning. 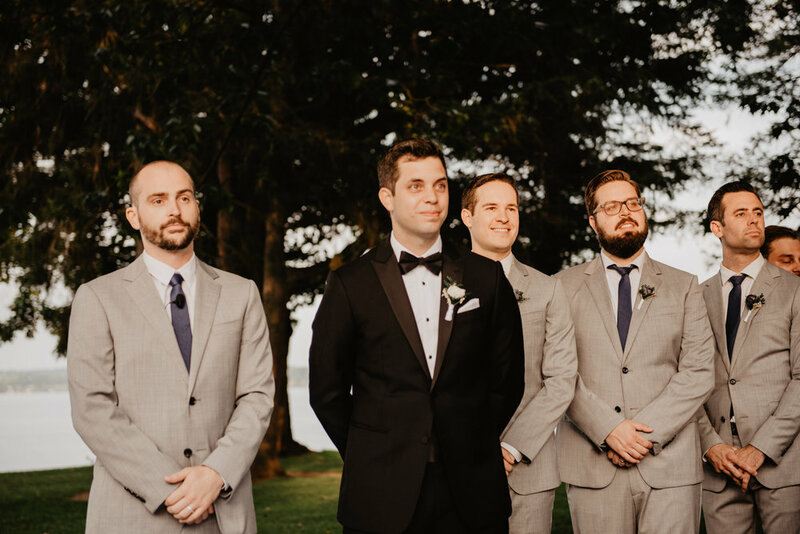 Kevyn and his groomsmen got ready at a nearby hotel, which provided the most beautiful setting for my second photographer, Sammy Caldwell, to photograph them in. I knew Kevyn and his guys would also be a ton of fun - they had lots of photo ideas for Sammy! And when they got serious, I couldn’t imagine a more dapper looking group! 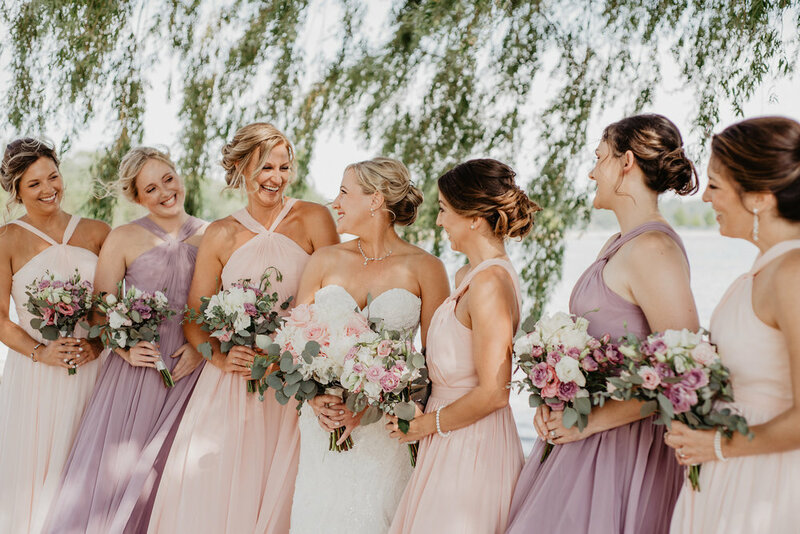 Ventosa Vineyards has one of my favorite ceremony locations because no matter which direction your camera is pointed in, there is beauty! 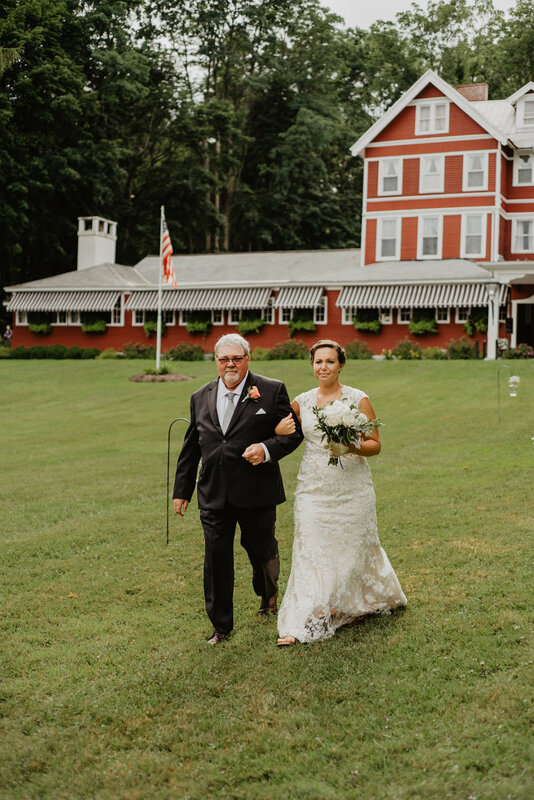 The mansion that sits on the property is beautifully situated in the background, and of course there’s the iconic vineyard overlooking Seneca Lake - you can’t go wrong. 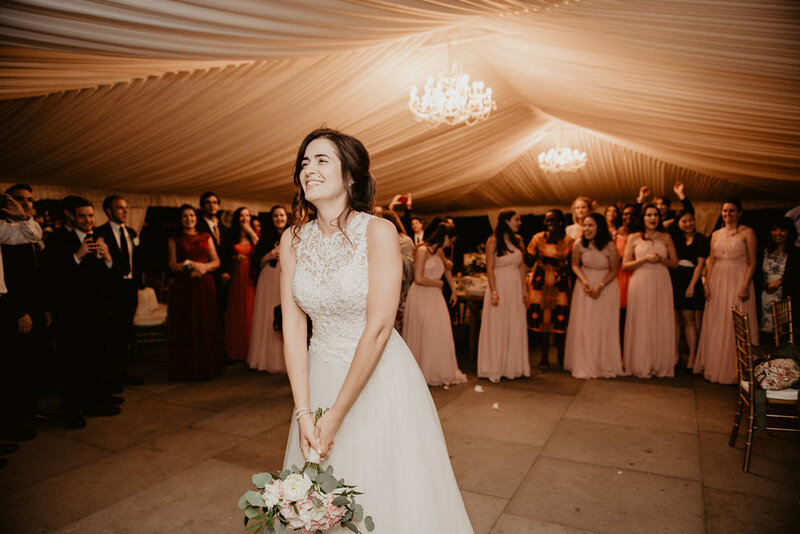 Their ceremony was full of emotion, from Kevyn’s first look at Jessica as she walked down the aisle with her dad to the mention of his late best friend and best man, Craig, who sadly passed away just months before their wedding day. Jess’ infectious smile and their laughter together brought everything full circle and made it a truly special experience for all of us. 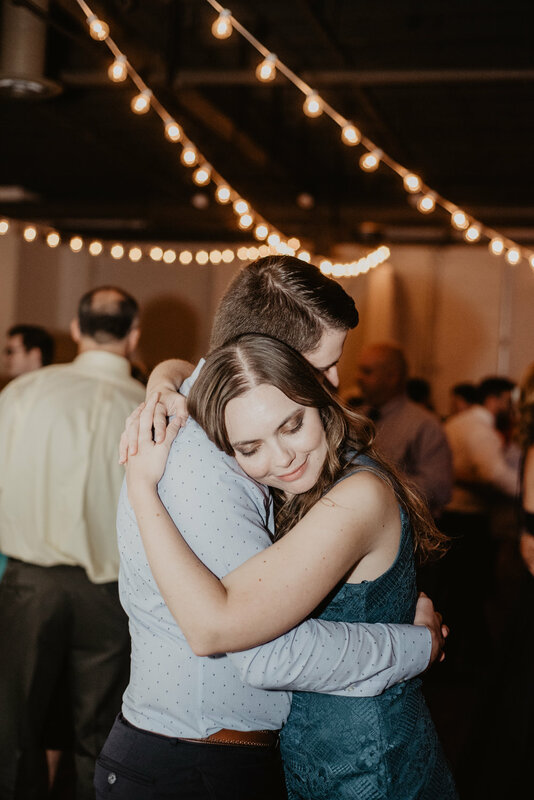 After photographing these two for their engagement photos a year before their wedding, I knew portraits with them would be easy because they truly enjoy each others’ company. With just a little direction, we made some of my favorite photos ever. But my MOST favorite moments of the day came after all of that. 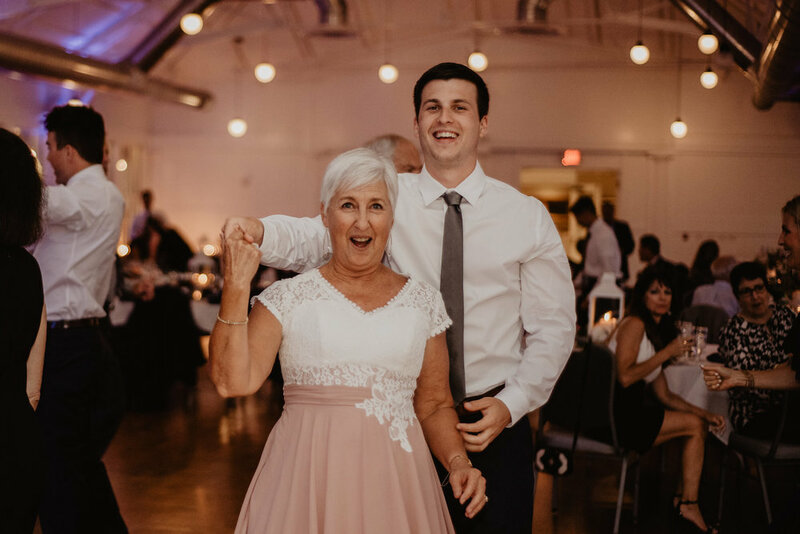 I could have never imagined Kevyn’s killer dance moves, which came right out of the gate in both his first dance with Jess and his dance with his mom! I’m glad they held tight to his hand because they could have easily been sent flying! 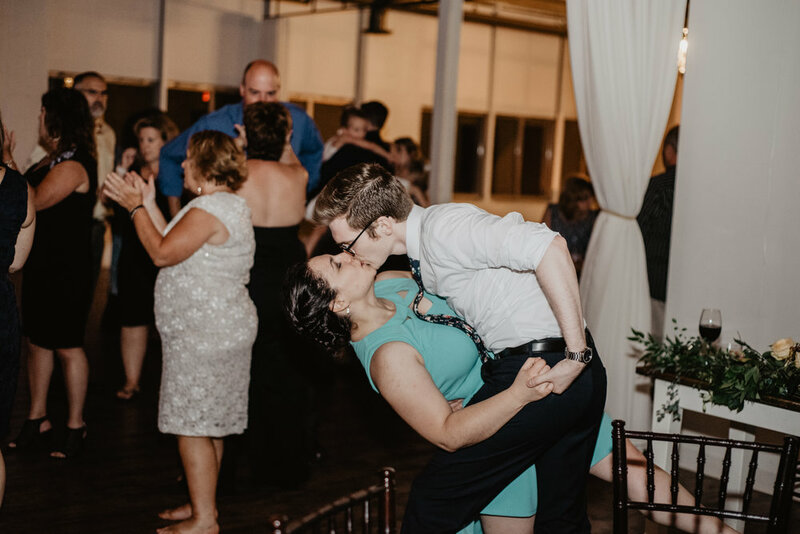 The rest of their reception was such a blast to photograph. Not a moment went by where I was at a loss for someone to photograph. 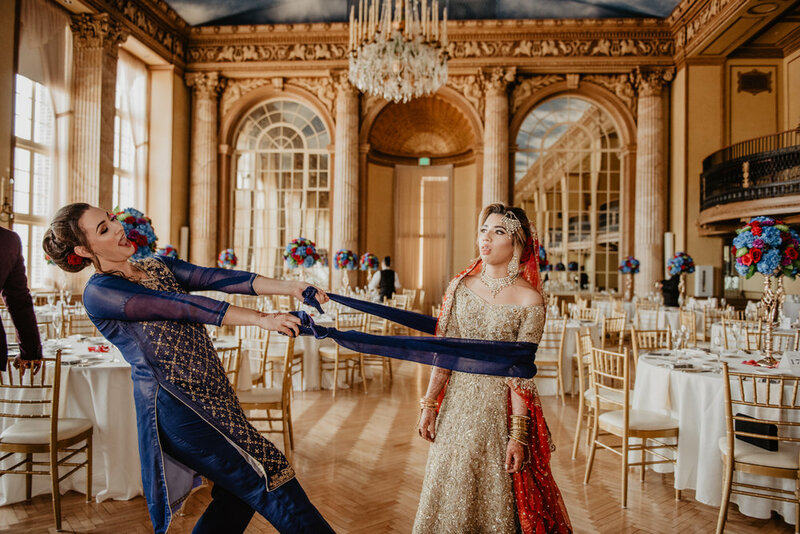 It’s not every wedding that pretty much all the guests hit the floor at some point! But Jess and Kevyn’s guests came ready to party. I think I smiled and laughed all night! 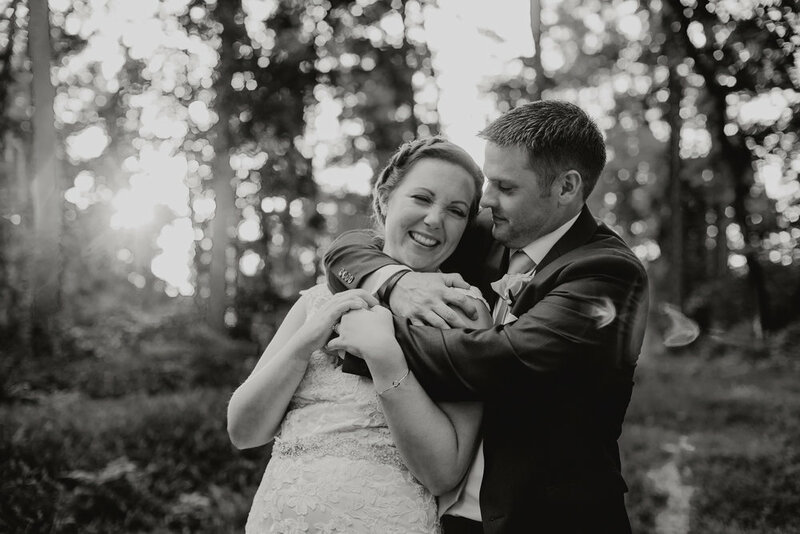 I’m so thankful for Jess and Kevyn’s love and support, and for the chance to photograph their wedding day. It will definitely be a favorite for years to come! 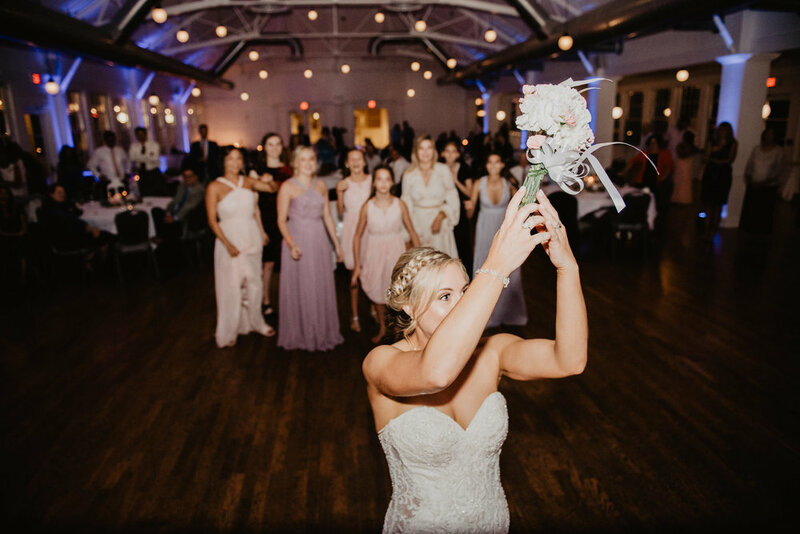 Click here for a highlight video by my sister, Olivia Bauso, from Jess and Kevyn’s wedding! I’m so thrilled to share today’s wedding with you. This one was a huge learning experience for me, and so exciting to be part of. 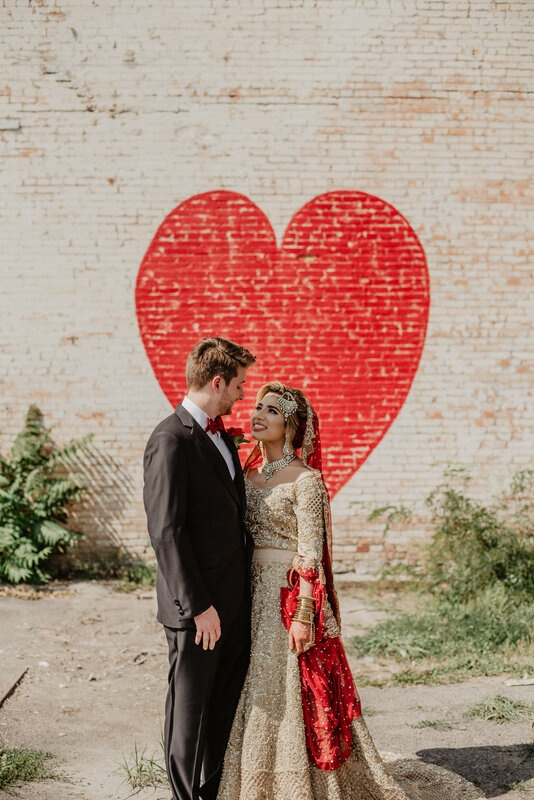 The colors, the traditions, and of course this sweet couple made the weekend so wonderful. 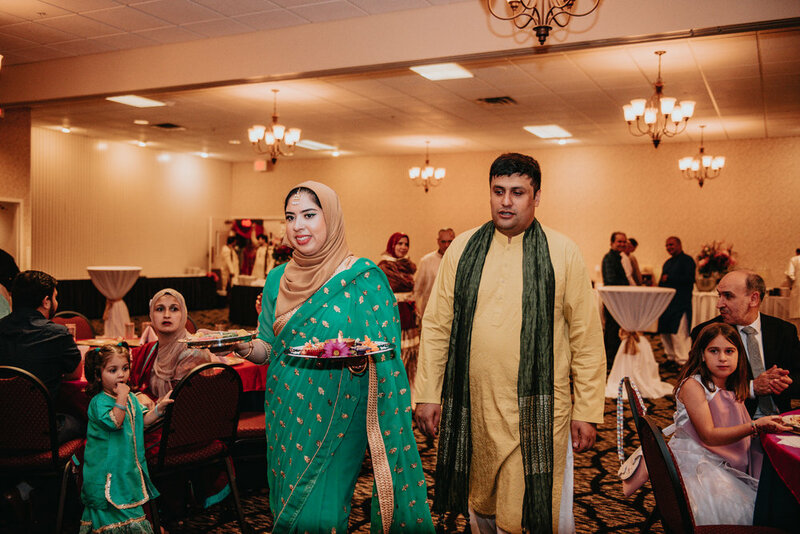 On Saturday, my sister and I began at Drumlin’s Golf Course, where Maria and Alan’s families came together for the sangeet. 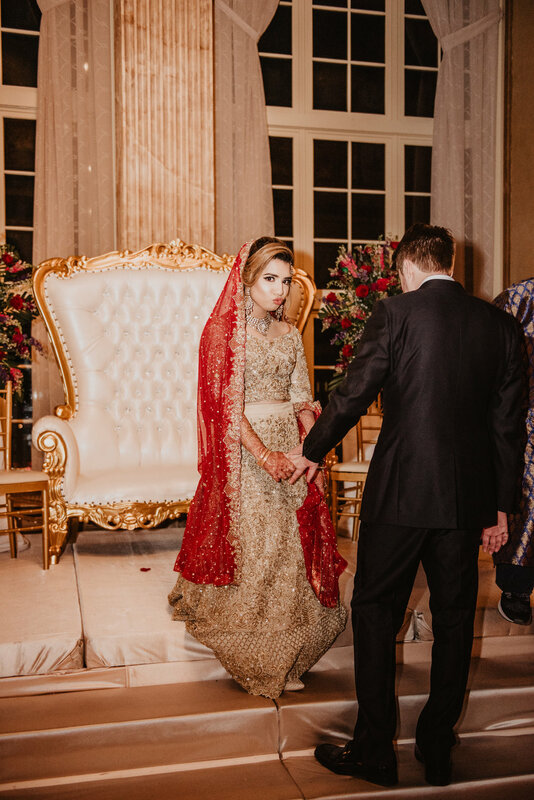 The sangeet involved Maria first being brought to the stage where Alan awaited her, and them sitting together (on a gorgeous golden vintage couch from She Rents Vintage) while their guests came up to take group photos, feed them special desserts, spread henna onto leaves in their hands, and visit with them. Maria loves bright colors, so this dress was her favorite of the two she got to wear on her wedding weekend. Sunday’s events were similar to what we think of in American weddings. I photographed the two and their close family members while they prepared for the day, we ventured out (on a brutally hot day in August!) 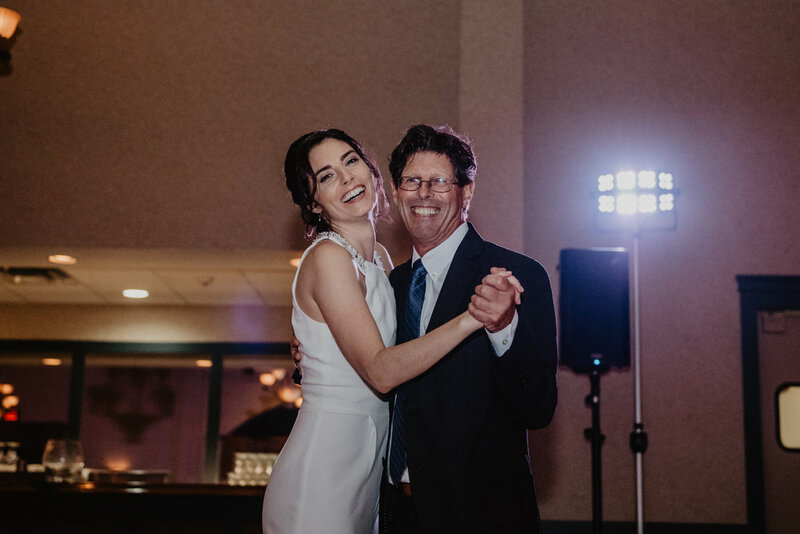 for portraits and then returned to the Hotel Syracuse for their reception, where guests would come to share a meal, take more portraits with the couple and dance together! 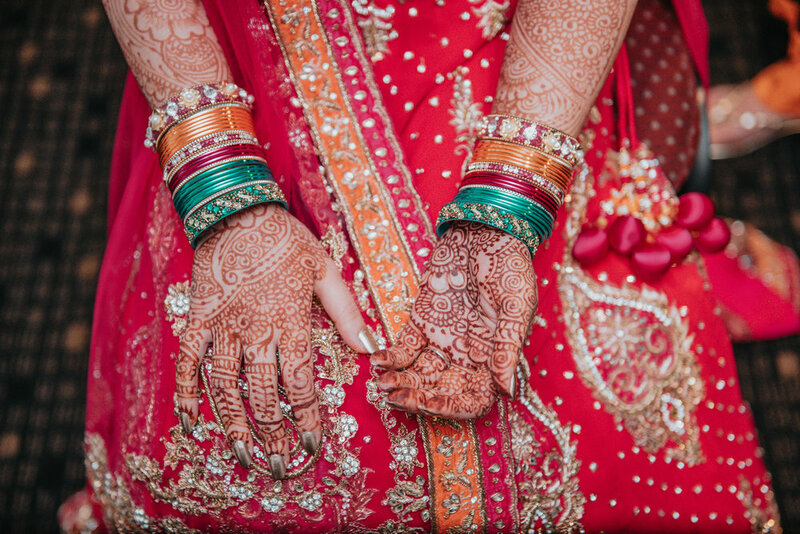 Like many weddings, this one varied a bit from the traditional Indian wedding. I was told that Maria wanted a more laid back, less fussy weekend. Even as I researched afterwards, so I could be sure to understand some things about their day(s), I see that many things were omitted or slightly different. I love that Maria had the wedding experience that she wanted, but that their customs were kept alive in so many ways! 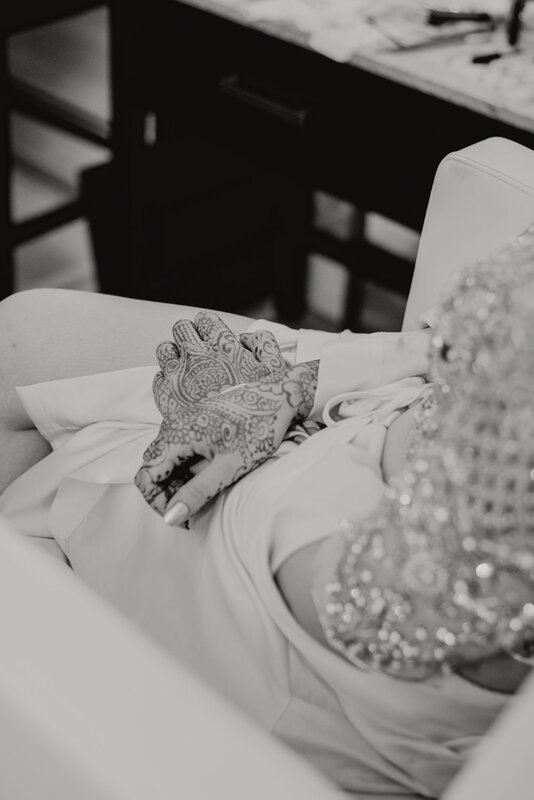 Every time I go into a wedding day, someone’s home, or really any setting for a photoshoot, I enter with the realization that I’m there as a witness and that at the very core of what I do is observation. This experience was no different, only that I felt like I needed be even more observant, more open to the unexpected (because none of it was what I expected!) and just along for the ride, camera in hand and ready to go. Thank you SO much for giving me this experience, Maria and Alan. I know these words can’t possibly do this experience justice, but hopefully the photos do! 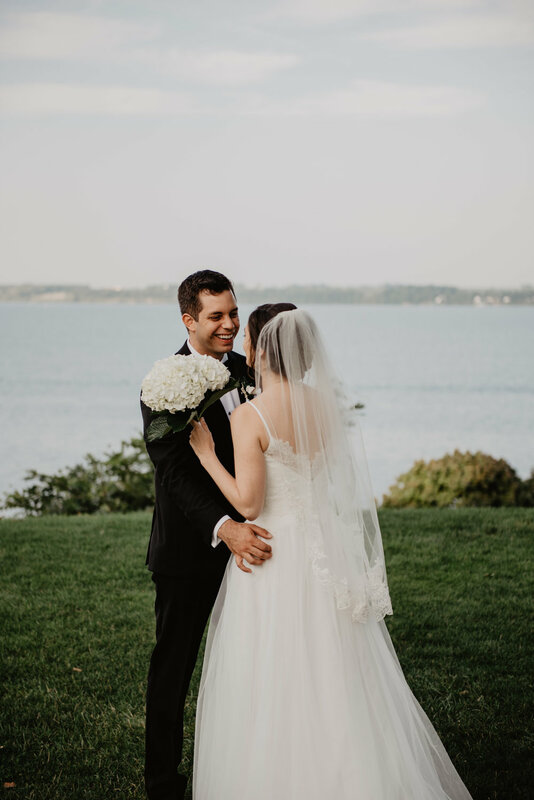 I’m so excited to finally pick up where I left off sharing my 2018 weddings. 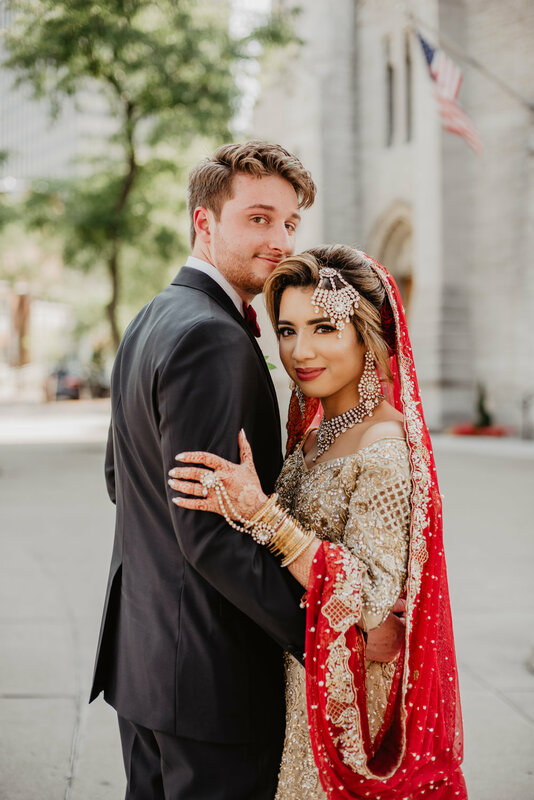 I have so many beautiful couples to share with you guys! Today, I’m starting out with Katie and Mike, who I had the pleasure of working with prior to their wedding day on their invitations. These two were lacrosse coaches at Colgate when we first began our stationery process, and have now moved to Philadelphia to follow their college coaching careers. One thing that strikes me about them is how deep their friendship runs. On their wedding day, they were so comfortable together - and always with genuine, complete smiles across their faces. 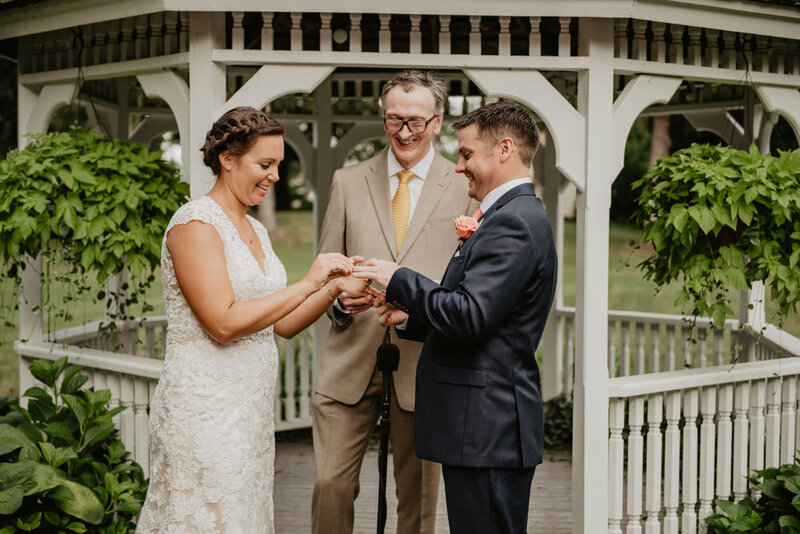 They spent their whole late July wedding day at Springside Inn, in Auburn NY, which is a fantastic venue for couples who want an all-inclusive wedding day experience. 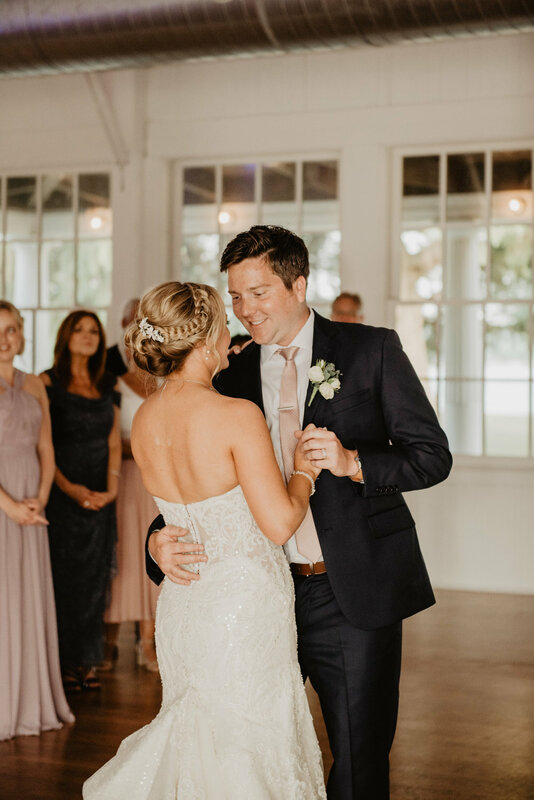 I loved the ease of going from getting ready upstairs, to their first look and portraits all over the grounds, to the ceremony on the front lawn, with the day ending with a reception behind the inn, under a gorgeous tent in “The Grove”. Katie and Mike’s wedding day was wonderfully laid back. 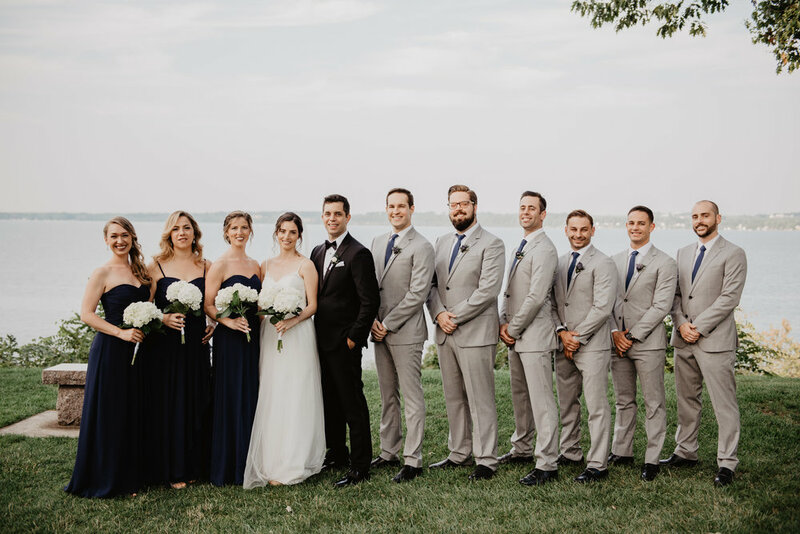 Their bridal party had fun together all day, which is always amazing to see. 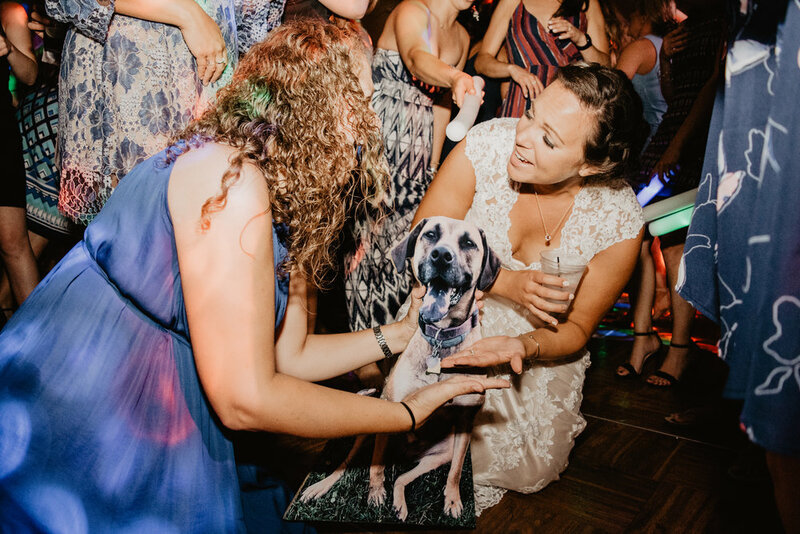 I also loved how they incorporated their beloved pup in the photos and ceremony! 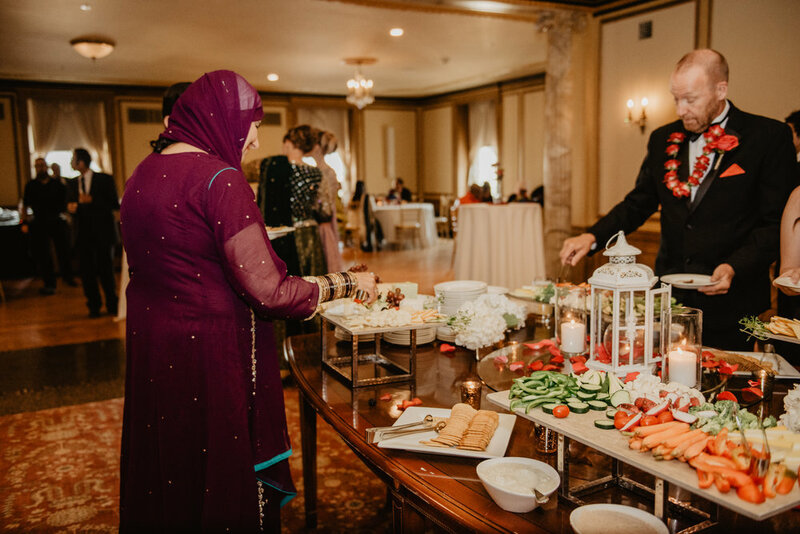 This was my first time photographing a reception that took place in The Grove at Springside Inn, and I hadn’t seen this gorgeous bar they built yet! 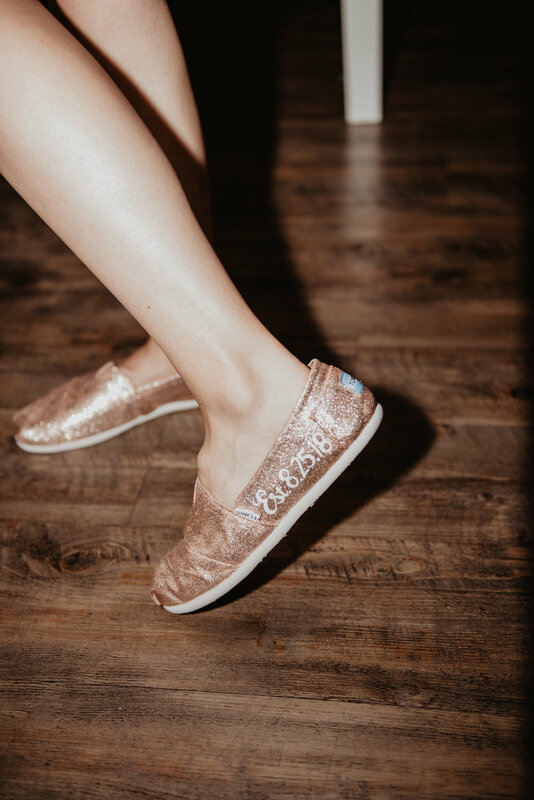 Such a fun addition for all of the guests who attend weddings here. I also loved the decorations on Katie and Mike’s tables, especially at their head table! 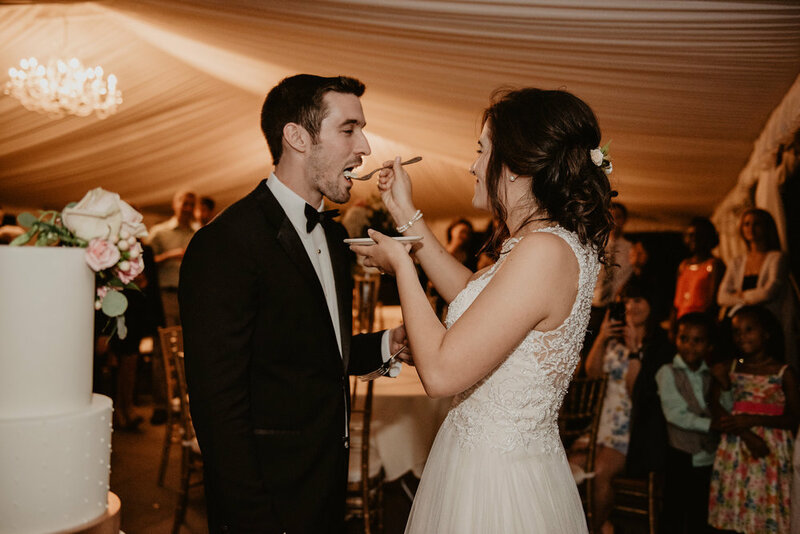 Although Katie and Mike described their taste to me as simple and no-fuss, their day was not without attention to detail. 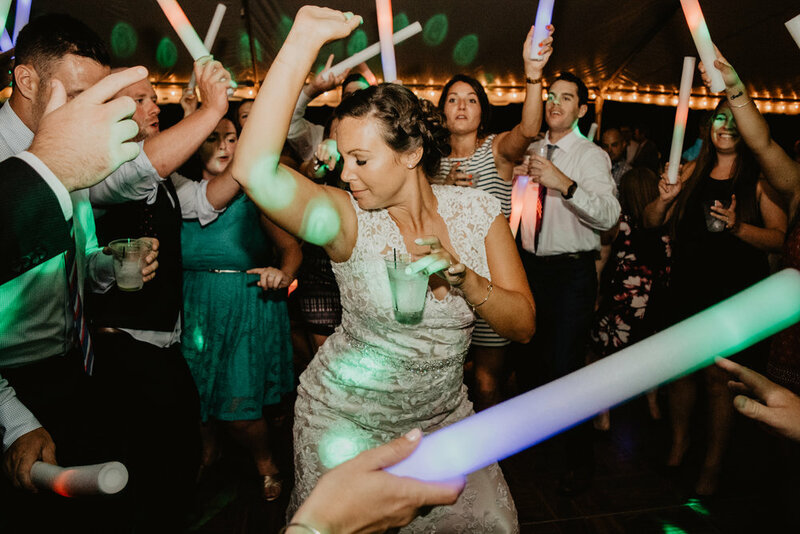 There was no question that Katie and Mike’s reception would be LIT! 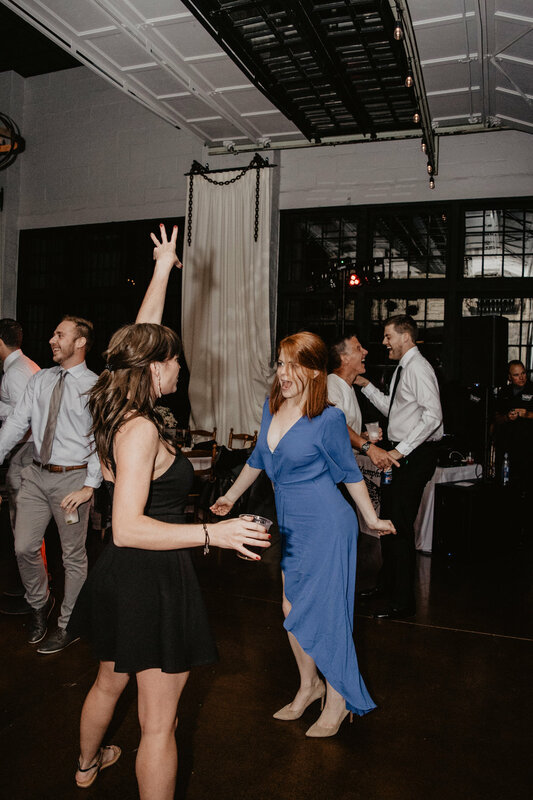 I love weddings where almost every guest hits the dance floor at least once. Also, the combination of late night pizza and foam glow sticks will make even the most “adult” guests ready to party! 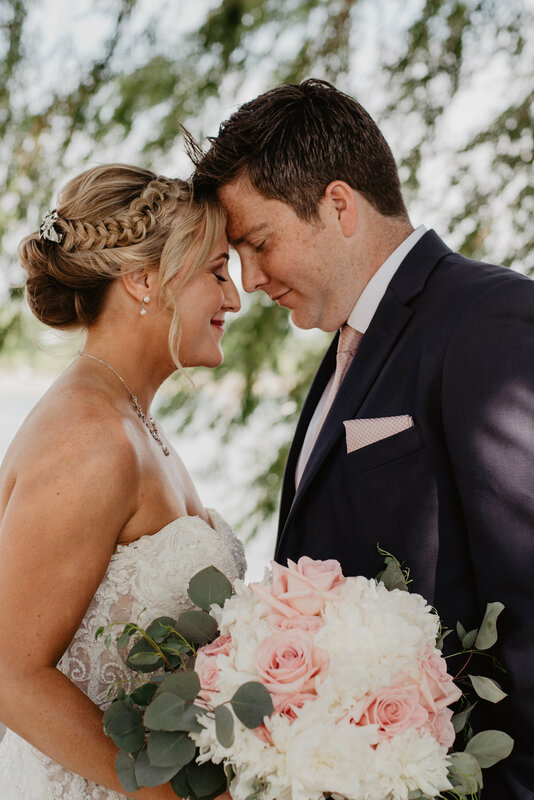 Thank you SO much to Katie and Mike for having me photograph your beautiful day, as well as design and manage your wedding invitation process. 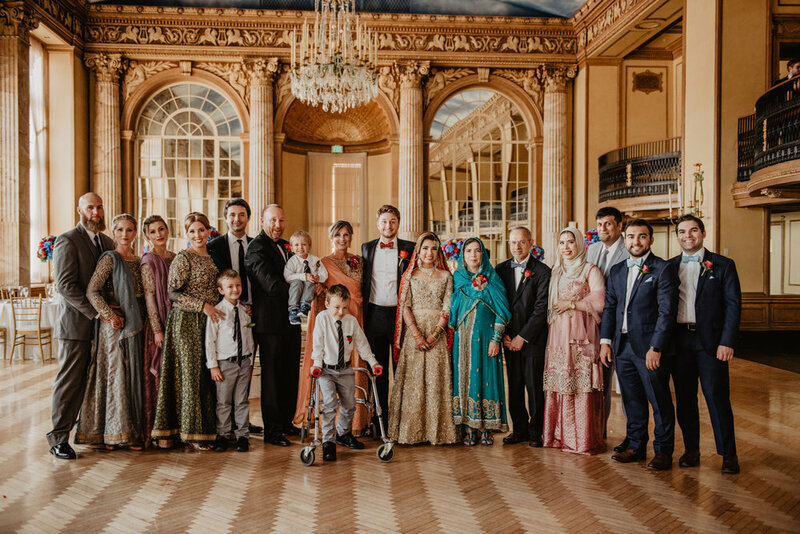 It was such a joy to be part of your wedding! When Steph and Chuck booked me almost 2 years ago, I barely had a wedding portfolio and was SO scared that I wouldn't live up to their expectations. But I said yes anyways because I figured I HAD to get better within two years anyways, and if they saw some potential in me then that's what mattered most anyways! I'm happy to say that I think I did live up to their expectations - any my own! 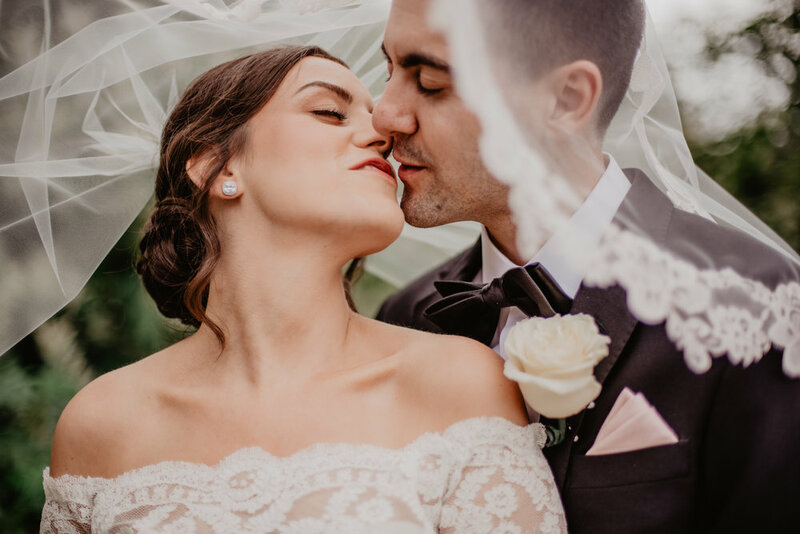 Photographing their day was so amazing, and I'm SUPER excited to share it with you here today! I arrived to photograph Steph getting ready at the house they rented for the occasion and got to work styling all of the dresses and details. 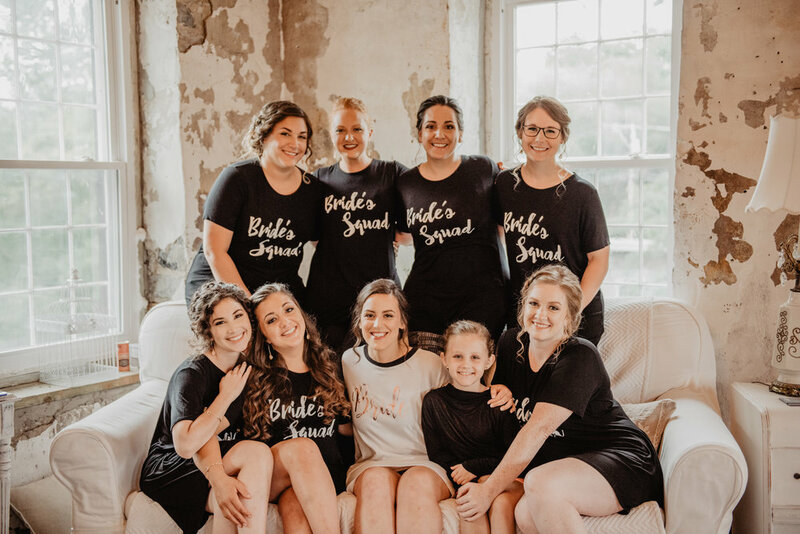 I didn't have a ton of time with them there, but I loved all of the fun energy going on with the bridesmaids, who are one big group of friends since high school and beyond! Steph put on her dress, and once everyone had gone out to the limo bus she pulled a surprise layer out of the closet - she couldn't decide between looks so she chose both! 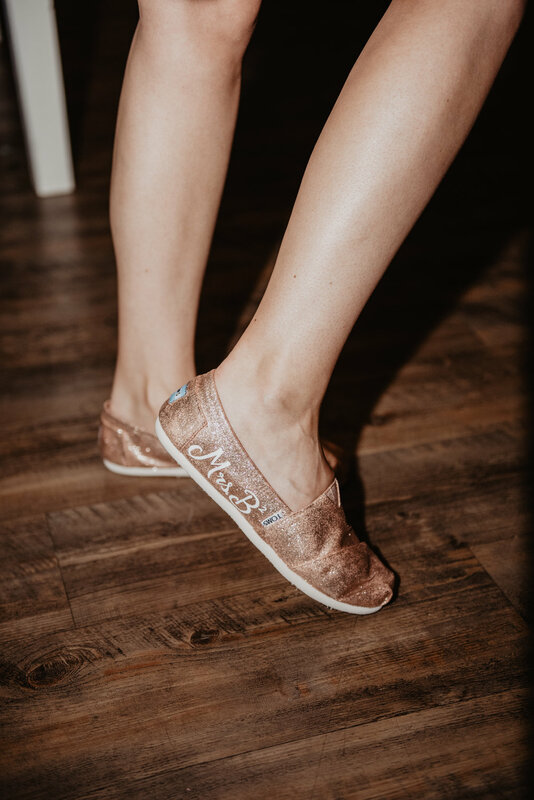 SUCH a fun idea and surprise for the bridal party to see! 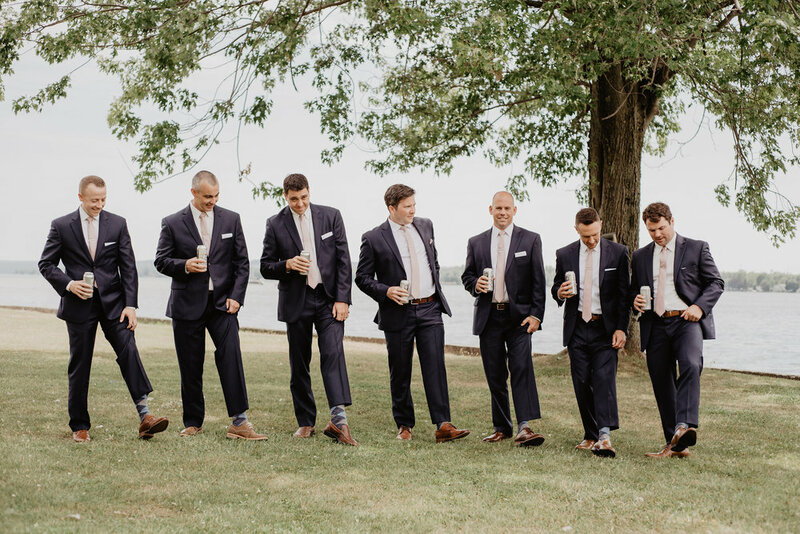 My amazing aSIStant photographer started out with the guys at St. Mary's, where she did an amazing job photographing them waiting for guests and the girls to arrive. I sort of had a feeling Chuck would be emotional during the ceremony, but no one could have anticipated just how much. 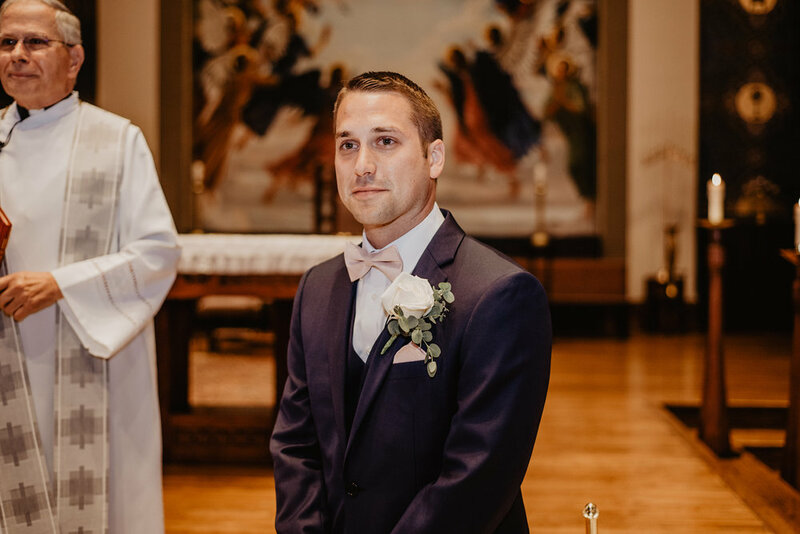 It was so, so sweet to see this reaction from him as Steph descended down the aisle. I loved how Father Vasile, a relative of Steph's extended his arm to comfort Chuck in this moment. So, so sweet. Their ceremony was the perfect length for a church wedding, not too long but filled with so many beautiful sentiments and lots more emotion. After they were married, we went a few streets over to the Seward House garden, where we photographed the bridal party and the couple. 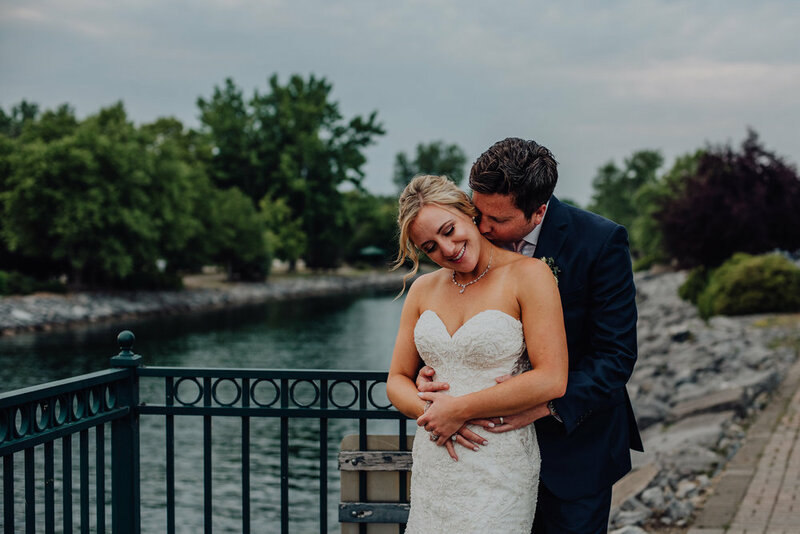 After leaving the garden, we hopped over to the top of the parking garage for some amazing couple shots with nothing but the cloudy sky, neutral concrete, one windblown veil and lots of love! It felt like rain was on the way, so we scooted up to the lake to hurry up and get all their photos done with just in case. 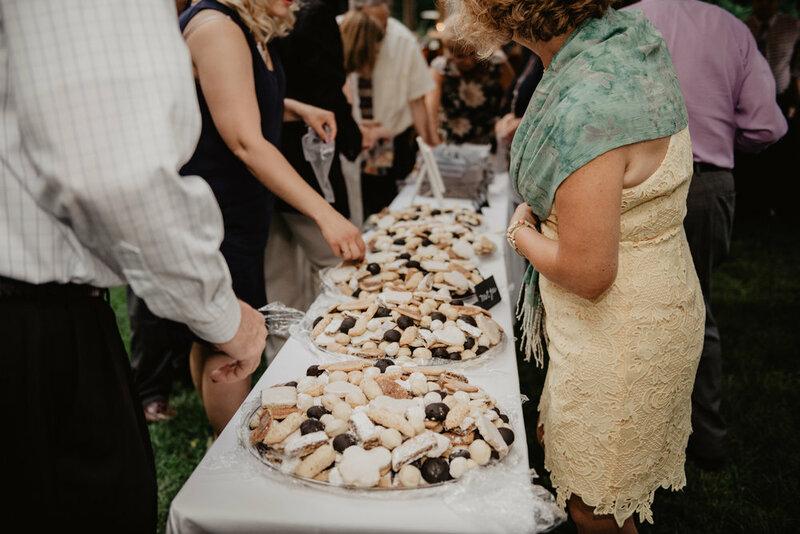 A reception at Emerson Park always means lake view photos, and these did not disappoint. 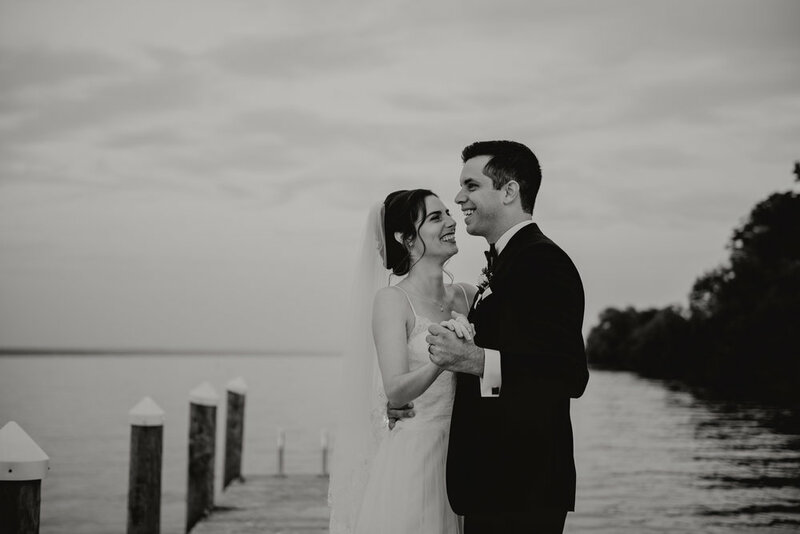 And honestly, the cloudy overcast sky is always welcome by me on wedding days, especially for these lakeside photos! I just love all the neutrals and warm skin tones. Ok, I'm only going to say two words about their reception because I think the photos will do enough justice: Fun + Epic. Thank you SO much Steph and Chuck, for trusting my vision through everything and having me photograph all the emotions on your wedding day. This was truly a wedding I will never forget and will always love! Rentals // Pretty Little Vintage Co. 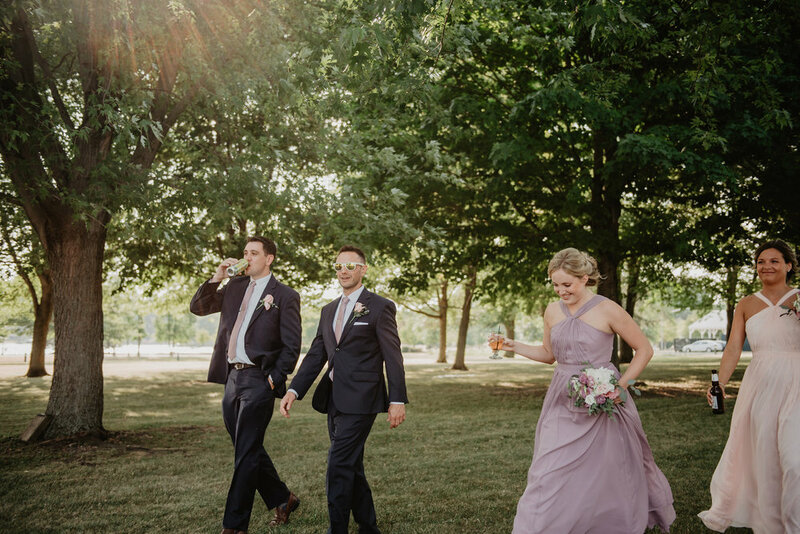 I'm excited to finally share the images from Audra and Anthony's wedding in July! 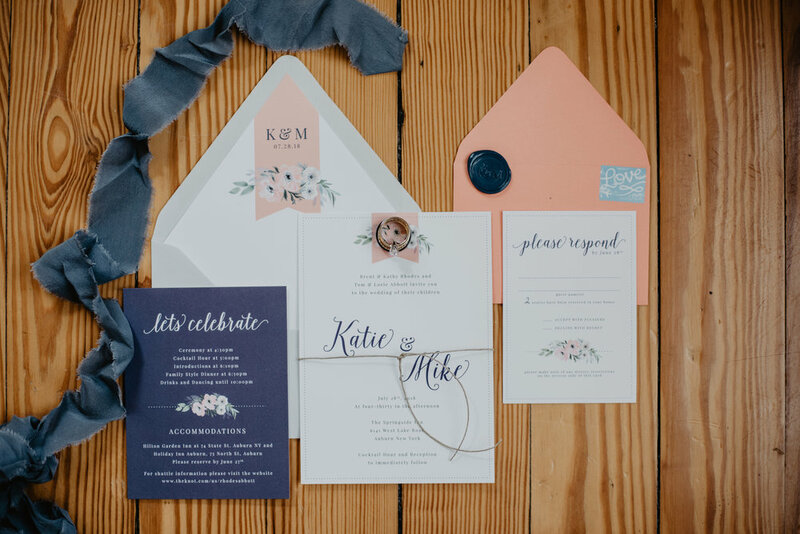 I wrote all about their stationery design process, which you can check out here. 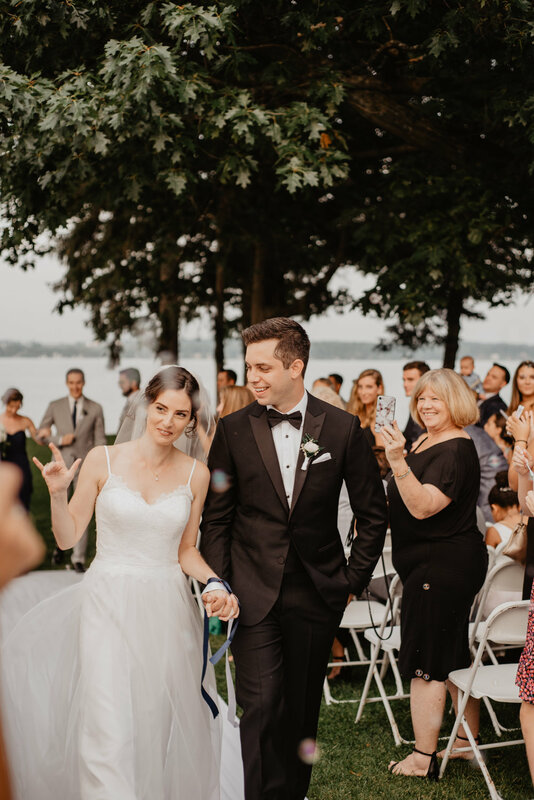 Their wedding took place on a Friday evening at the Emerson Park Pavilion in Auburn, NY right on the tip of Owasco lake. 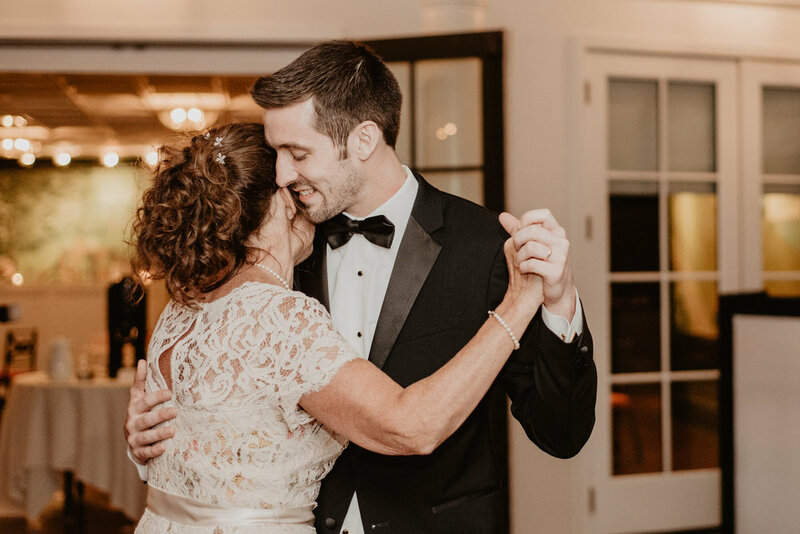 Audra's mom lives in a gorgeous home with big windows that overlook the lake, and hanging out in the water seems to be a big part of how this couple likes to spend their time when they're visiting from their home in Chicago. 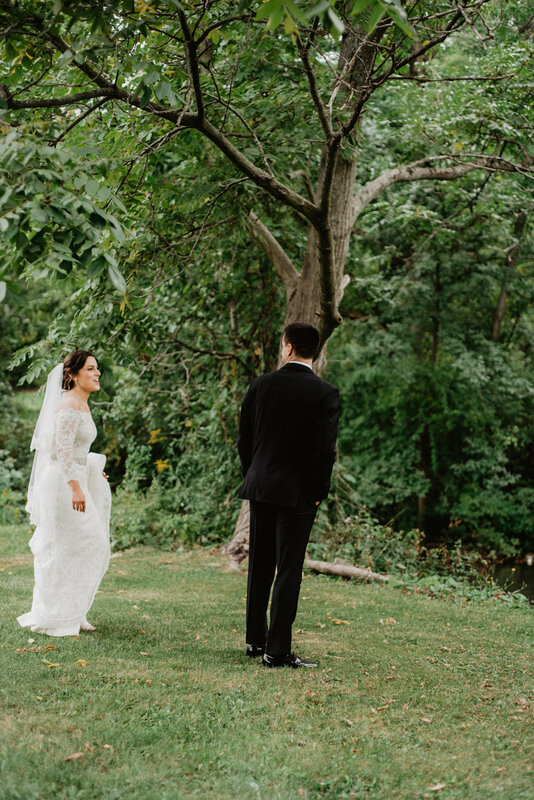 It's naturally fitting that they got married right next to the same lake! Audra began the day by getting ready in her mom's home. 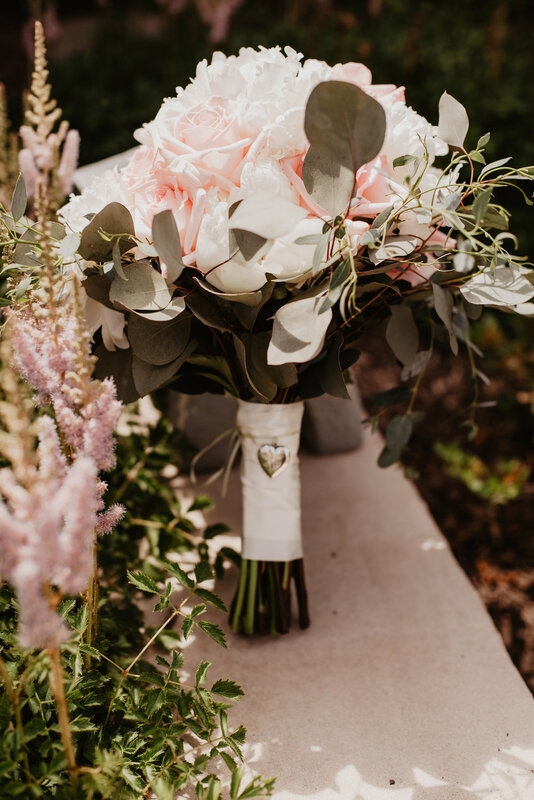 I had the pleasure of delivering their bouquets, since my mom (The Flower Shop) made them, and got to capture the emotional moment when Audra saw not only her beautiful flowers for the first time, but the locket with a photo in memory of her dad attached to the flowers. 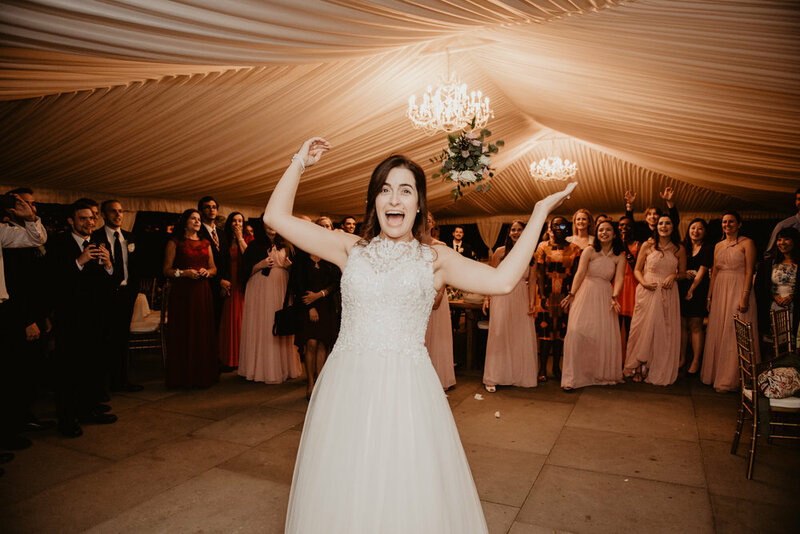 After everyone posed for some photos in their matching jammies and finished getting ready (not without a little crunch to the timeline - don't worry brides, it happens more often than you think!) we headed down to the school bus shuttle for the couple's first look. At last, the couple were able to see each other! 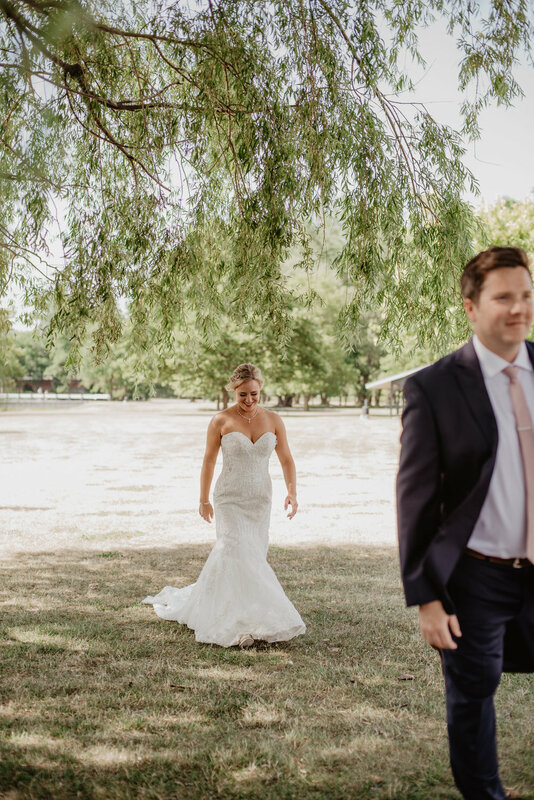 We took some portraits of them near the beautiful willow tree on the Deauville side of the park as well as group shots with their bridal party. 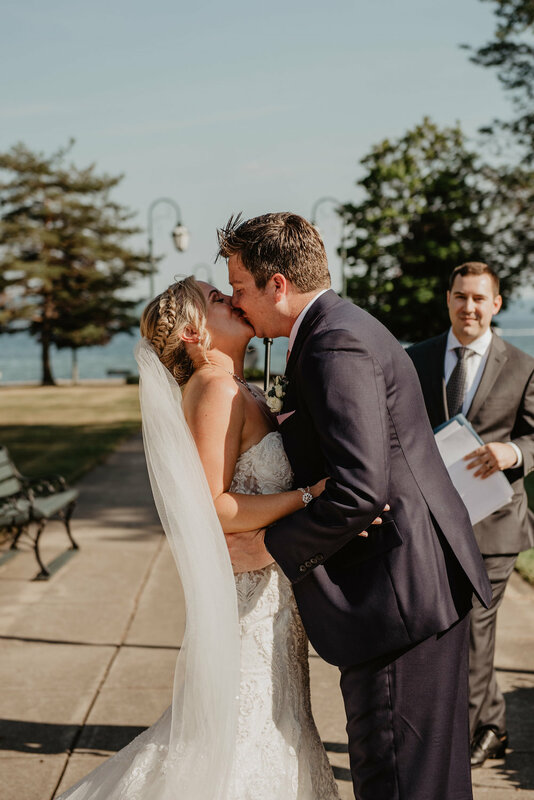 Their beautiful ceremony took place behind the pavilion, overlooking the lake. I can never get enough of the gorgeous pink flowers and landscaping around the fountain where ceremonies often take place! 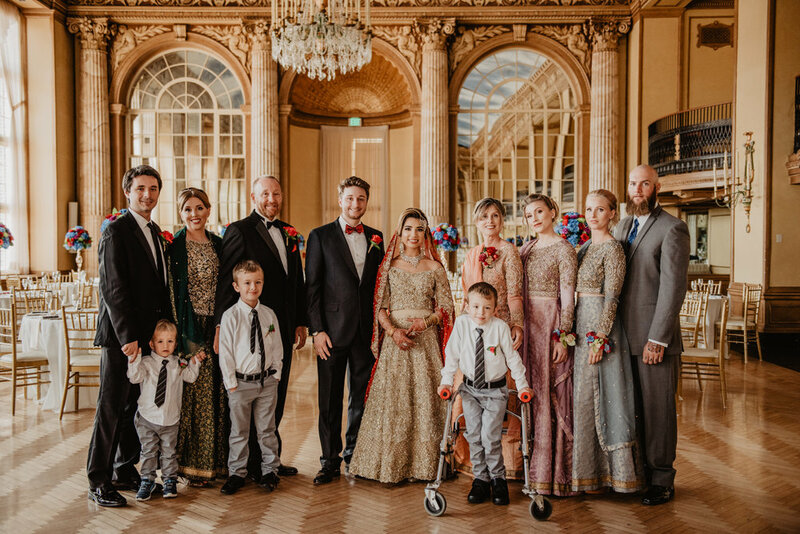 In no time, the couple was married and we set off to photograph their family groupings, and then headed towards the lake for some more photos of them and their bridal party. 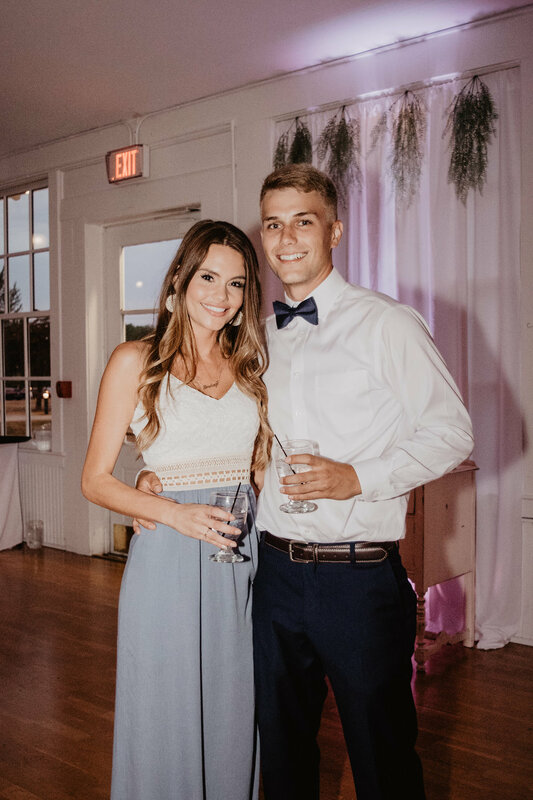 Audra and Anthony met as pilots, and I loved the nod to their profession with their favors - cute little luggage tags for each guest! 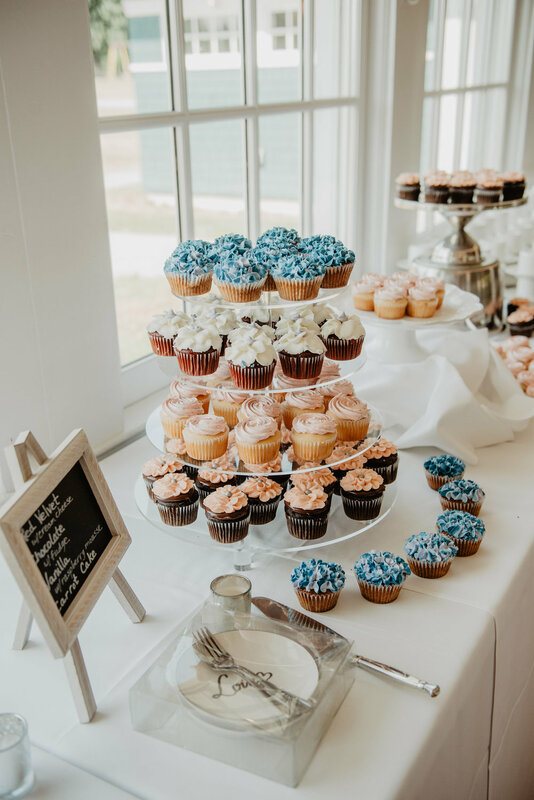 The rest of the details inside the pavilion were so sweet and simple, but made the room look stunning! My favorite part of their reception was photographing all the kids! 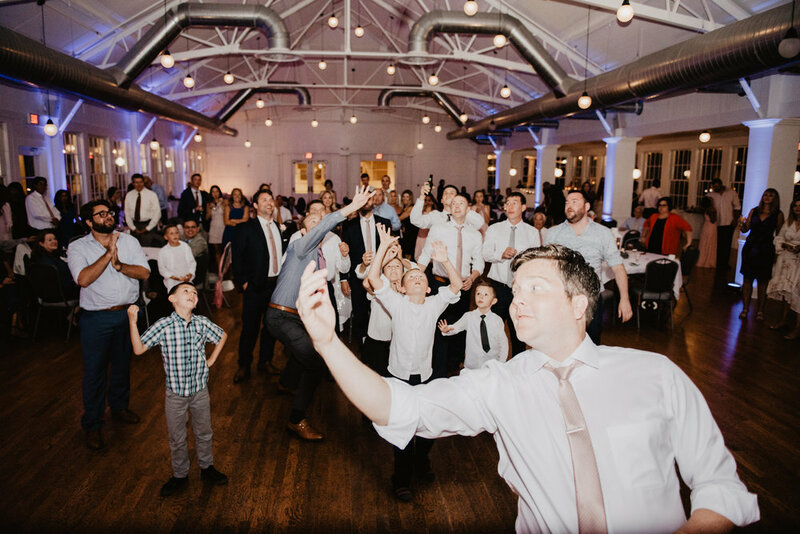 Not every wedding has kids present for the whole evening but when there are, you can bet I'm capturing their every move. The boys had all the moves that night! 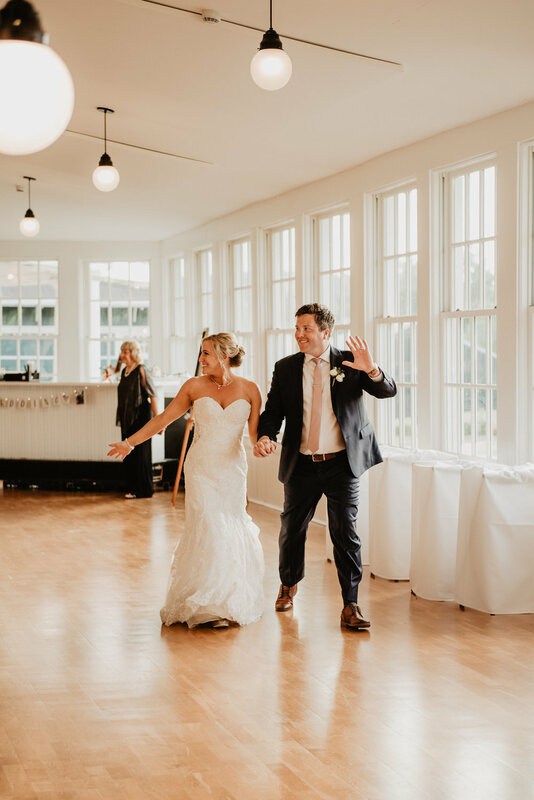 Thanks so much for coming by to read about Audra and Anthony's wedding, and to see some of my favorite photos from the day! Congrats to this beautiful couple, and thank you so much for having me and Olivia to photograph your day! Hair + Makeup // Crazy Beautiful Co.
Hey there! 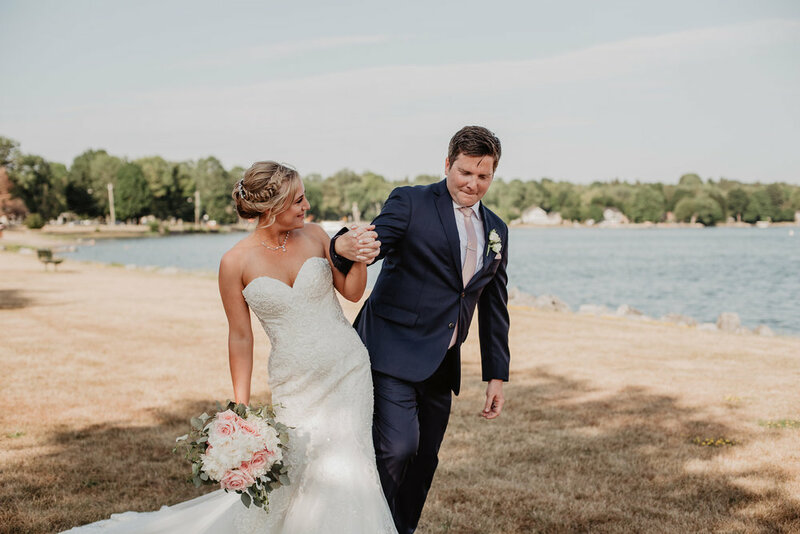 I'm here to share my favorites from a gorgeous wedding from early July at the Aurora Inn. 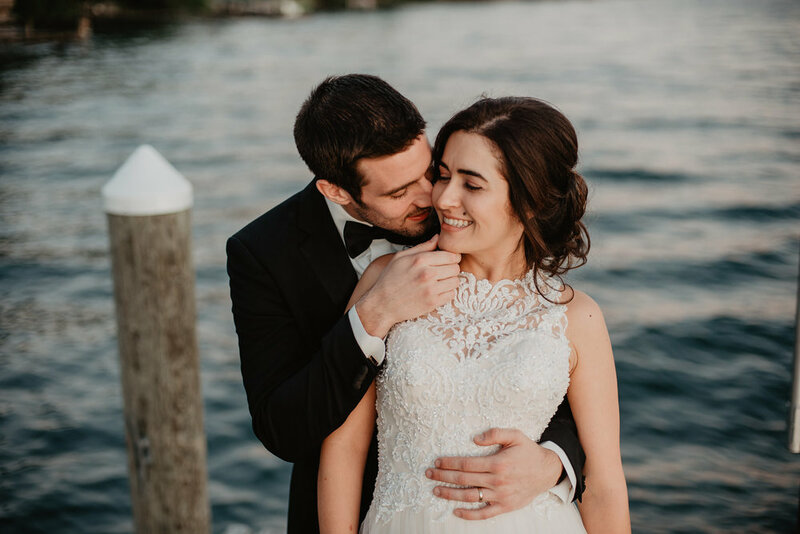 Larissa and Jonathan were expecting guests traveling from faraway places - as close as New Jersey and as far as Brazil - and did such a beautiful job combining cultures and really making their day all their own. They couldn't have chosen a more beautiful place to do it in - Aurora NY is one of my favorite little towns in the Finger Lakes Region and this Inn on the lake is just magical. It was a perfect early July day, not too hot and with a nice breeze (which turned into straight wind later on near the lake haha!) 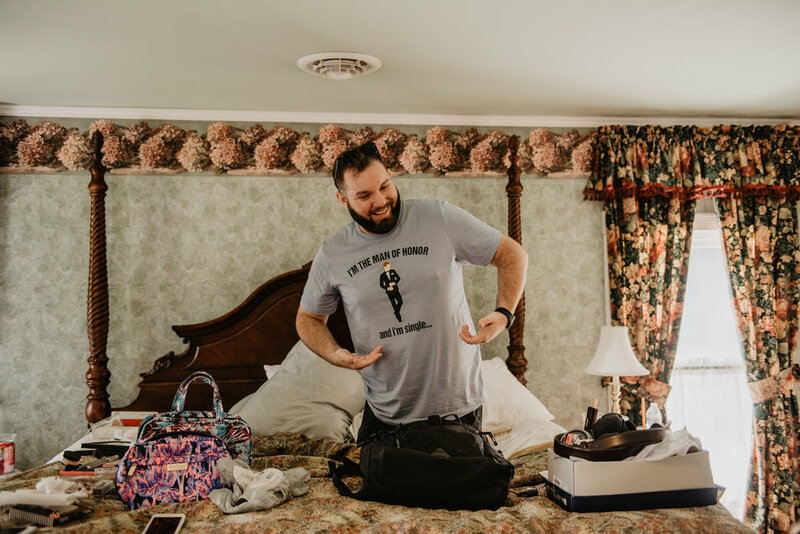 Larissa and Jonathan got ready and dressed separately with their bridal parties in rooms just next door to each other at the Inn. Olivia and I arrived and photographed all of Larissa's details - flowers, jewelry, invitation, dresses - outside on the front balcony. While the girls finished getting ready and Larissa read her sweet note from Jonathan, the guys spent time outside, taking photos with Olivia before the ceremony. 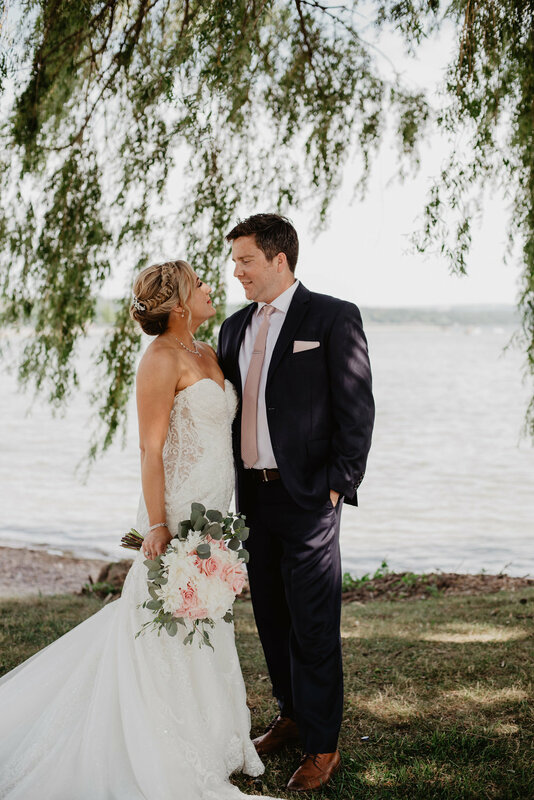 Their ceremony took place right beside Cayuga lake, with stunning views of the water and land across the way. 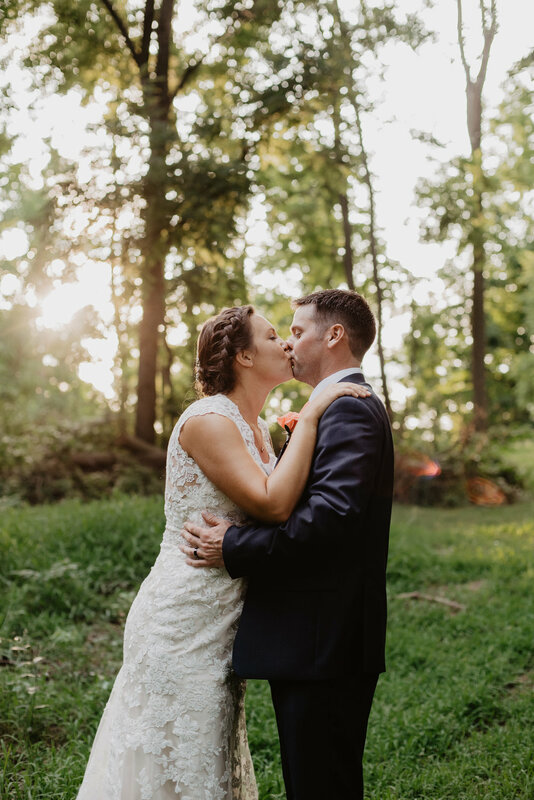 The light streaming through the trees on the property was just gorgeous! 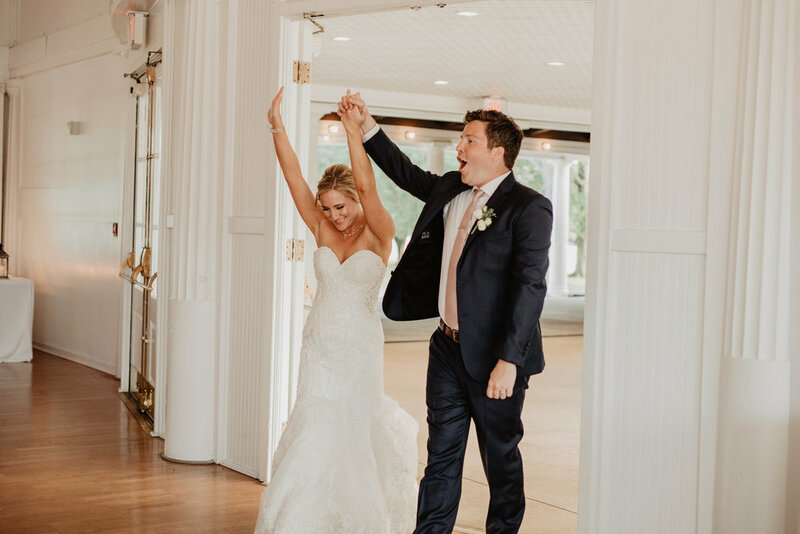 As Larissa descended the stairs behind the Aurora Inn, Jonathan kept his eyes closed until she made her way to the end of the aisle between their guests. His reaction when he opened them was so sweet to watch. The joy radiating from his expression was absolutely perfect - I'm sure he was even in awe of how beautiful she looked! 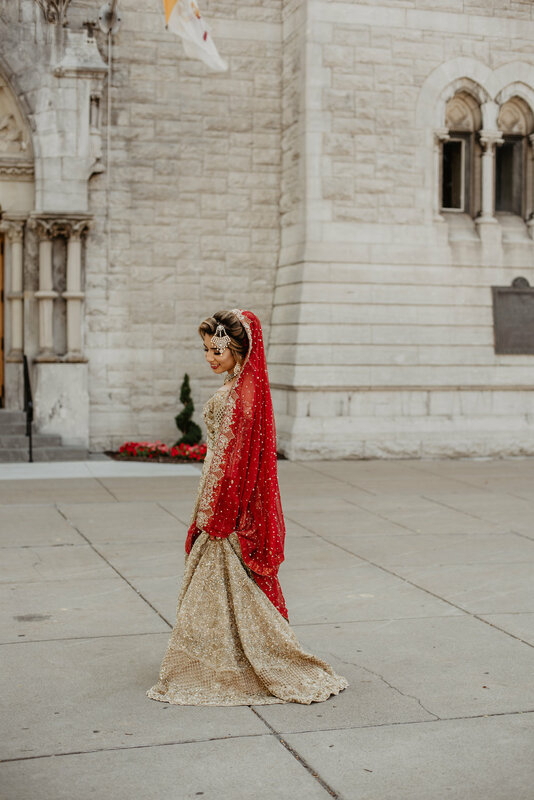 Even though I had seen her dressed already, I still couldn't believe how perfect she looked under that veil. Larissa's family mostly traveled here from Brazil, and many of them don't speak English so the couple's whole ceremony was translated in Portuguese. Although it made everything twice as long, it was such a thoughtful and special addition. They even sang a verse of a song together in Portuguese! After these two were married, sealing the deal with their very first kiss as a couple (!! ), we ran through their family photos and went on to get bridal party photos on the grounds behind the Inn. This group had lots of good ideas and had so much fun together! After all the group photos, Larissa, Jonathan, Olivia and I ventured around the front of the Inn to take portraits of the couple. I can't tell you how excited I was to finally shoot a wedding here and capture all of the historic beauty of the property! One of the things I love most about this venue is that there are so many beautiful nooks for wedding guests to enjoy during the evening. 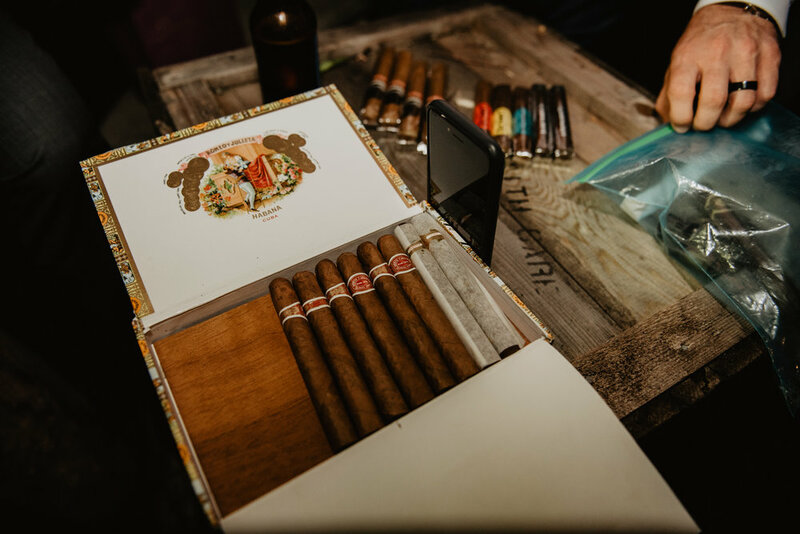 From the indoor bar area on the bottom floor of the Inn to the lakeside fire pit, guests are free to break out into their own groups to experience many different views on this beautiful property. Jonathan and Larissa planned a bunch of lawn games and activities for their guests to enjoy, which was really fun to photograph! This is the perfect location for lawn games since there's so much... LAWN. Jonathan recently finished his masters in engineering at Cornell, and made all of the games himself - including this giant Jenga game... which he lost! 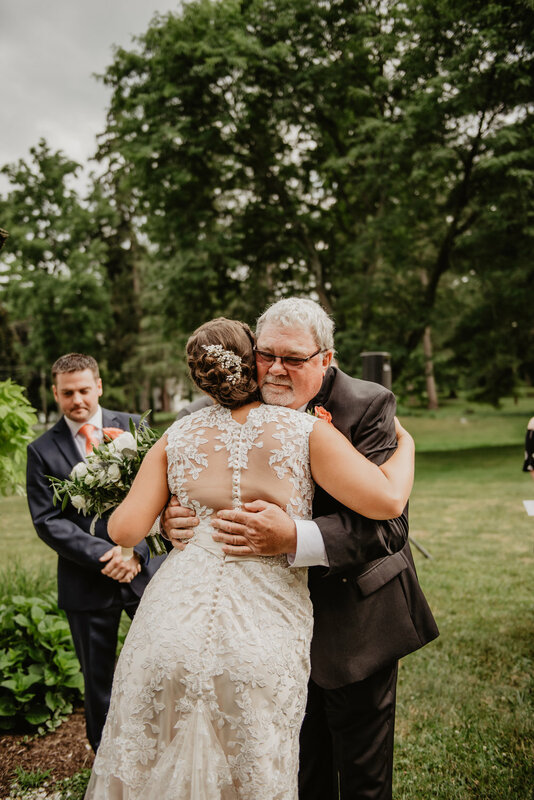 Once the reception was underway, Larissa's father made a really beautiful speech that had everyone tearing up. 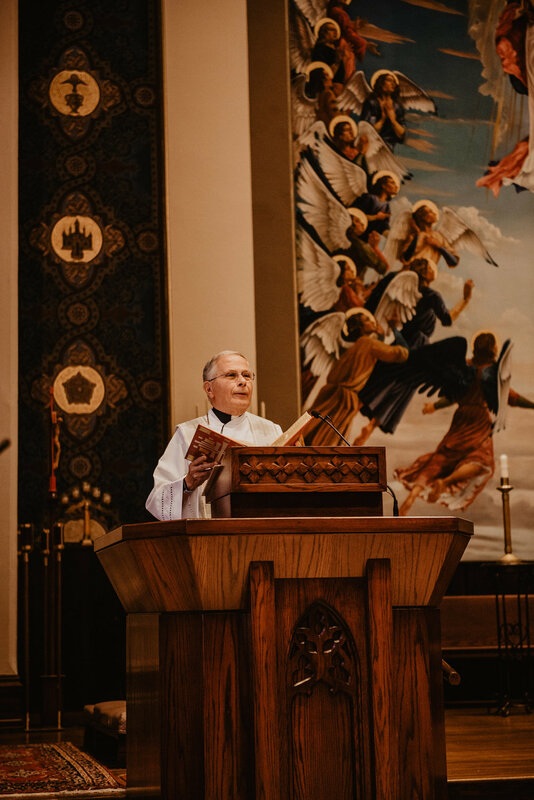 He talked about how when she left home to come here for her education he was worried that her faith wouldn't be a strong, but that he was so grateful she found Jonathan so she could be with someone who also had a strong faith to grow with. 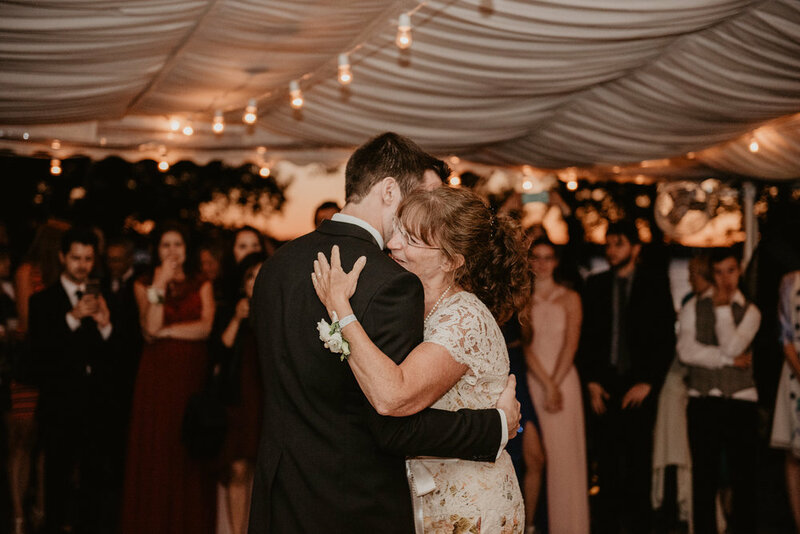 In that moment, I was imagining all of the times you have to let your kid(s) go, hoping that they carry with them all the values you've given them when they're young. 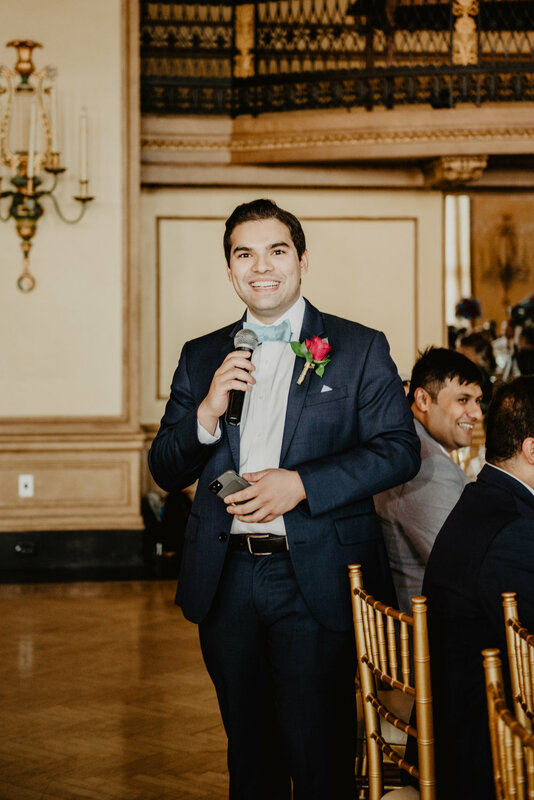 I loved that Larissa's maid of honor translated his speech so we could all hear his beautiful message to his daughter. After a delicious dinner, we headed back out towards the water to photograph Larissa and Jonathan under the setting sun. We juuuust missed the sun by about 5 minutes, but these photos are a testament to the beauty of an evening just after it goes down. The water was a deep shade of blue and the sky a delightful lavender with an orange horizon. These combination of colors always make skin tones warm and soft - my fave! After their portraits were done, we went into their first dance as well as parent dances - ahhh, more emotion!! 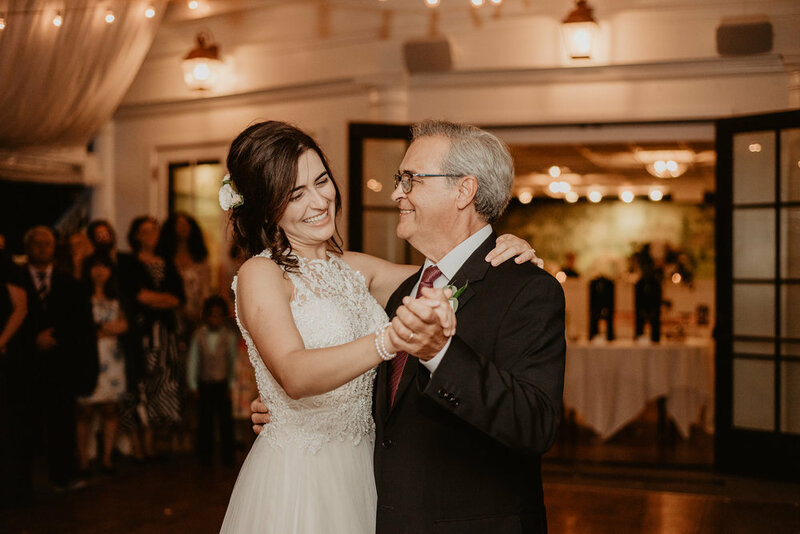 Larissa's dance with her dad was a Portuguese ballad that everyone seemed to know the words to - it was so beautiful seeing them being serenaded by all of their guests who came so far! The rest of the evening was spent taking lots of group photos with family and friends, a boquet toss, cutting their gorgeous (and seriously delicious) cake made by Stacey Underwood at The Cake Shop CNY, and a little bit of dancing! This wedding was such a pleasure to photograph. 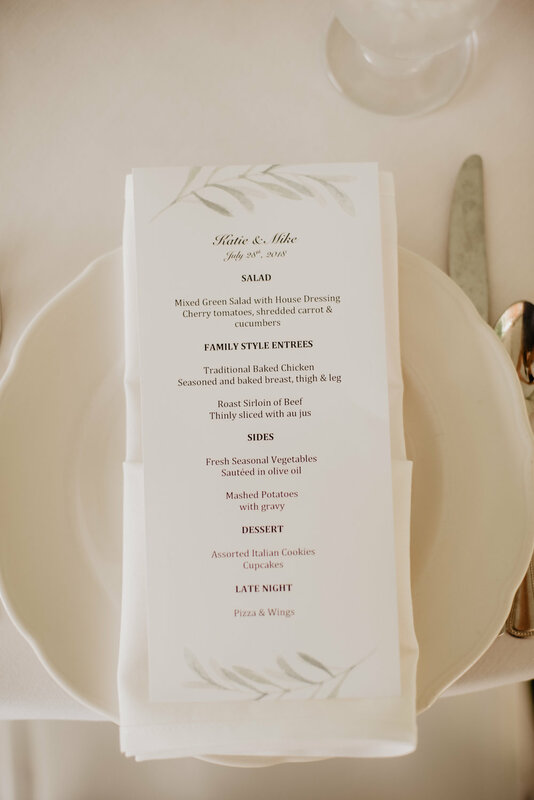 All of the details were just exquisite, and at a venue like the Aurora Inn you really can't go wrong! I can't wait to photograph another wedding there, hopefully in the near future! !